Unfortunately, after spending more time out west and in the mid-west, I found that I had lost time to explore the rest of the country. I ended up having to drive straight through to the east-coast after Santa Fe, New Mexico. It’s a shame because there is truly so much more to see! 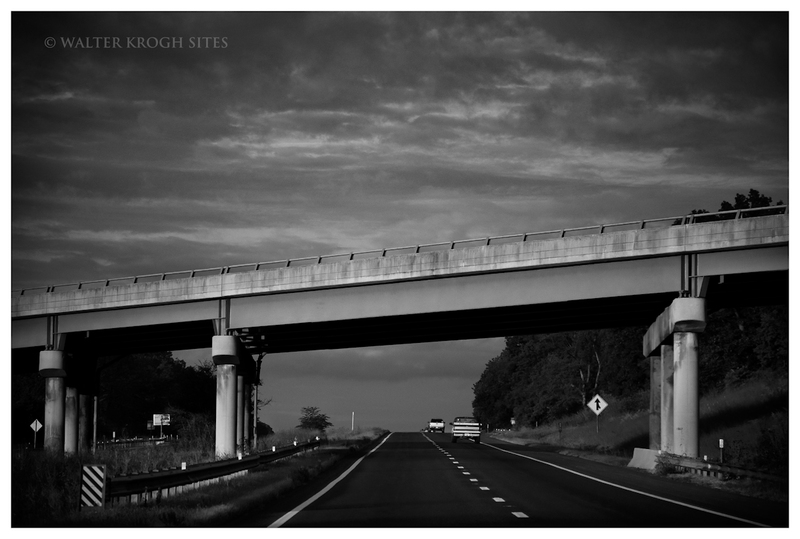 As a project for the winter I may continue and re-structure this project with some day trips throughout the east-coast. I will post links to these new projects as they are created and evolve. While out walking the beach at sunrise, I ran into a lady walking her dog. We walked and talked together for a little bit. Kavita is born and raised in Hollywood, but has been traveling most her life. For several years she ventured the country in her purple RV. She loves to explore and visit new places and shares these experiences with her dog ‘Hap’ for happy. Kavita has severe narcolepsy and Hap is her service dog. “He has saved my life many times. I wouldn’t be here without Hap” she explains. Kavita now roams from camp to camp and stays extended periods so she can truly explore the areas in-depth. She loves the lifestyle and the people she meets: “It is always a new adventure and if it weren’t fun, I wouldn’t it?” She has traveled most of the country and expressed a true love for The Old Spanish Moss Trail in Louisiana. –> Information on elCapitan coming soon! 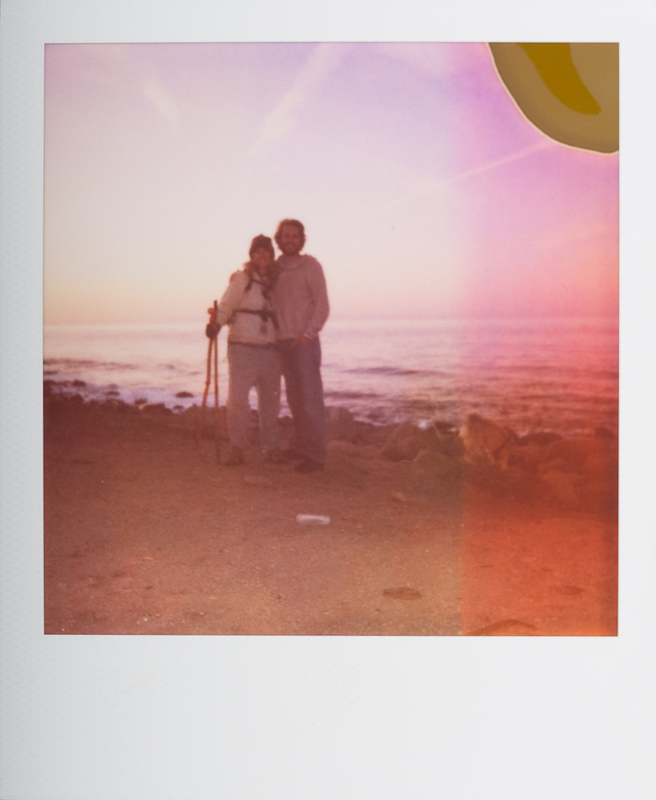 Here, Kavita and I at the beach during sunrise. –> click image to view larger! While sitting on a bench after most of the descent from Cold Springs Trail, this guy asked if I knew the way to a specific basin he wanted to see. 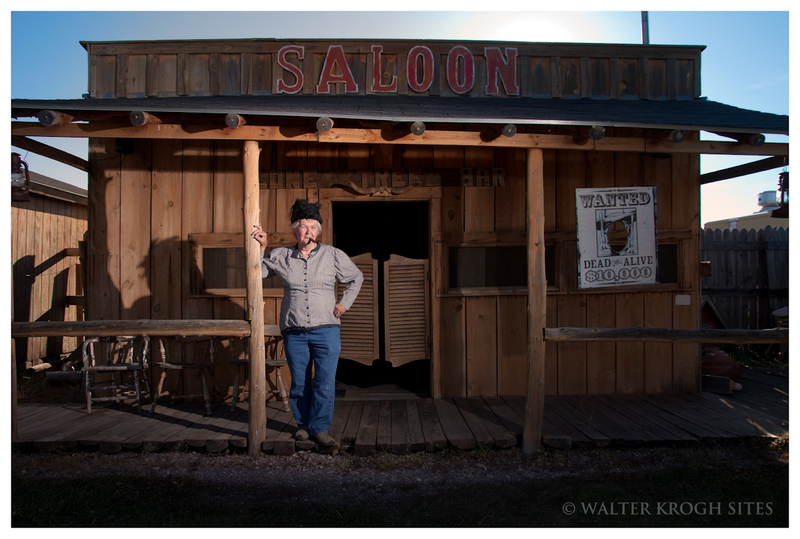 I gave him directions and pursued a short conversation with him before asking if he would stand in for a photograph. Dave is from San Diego and goes to San Diego State University. 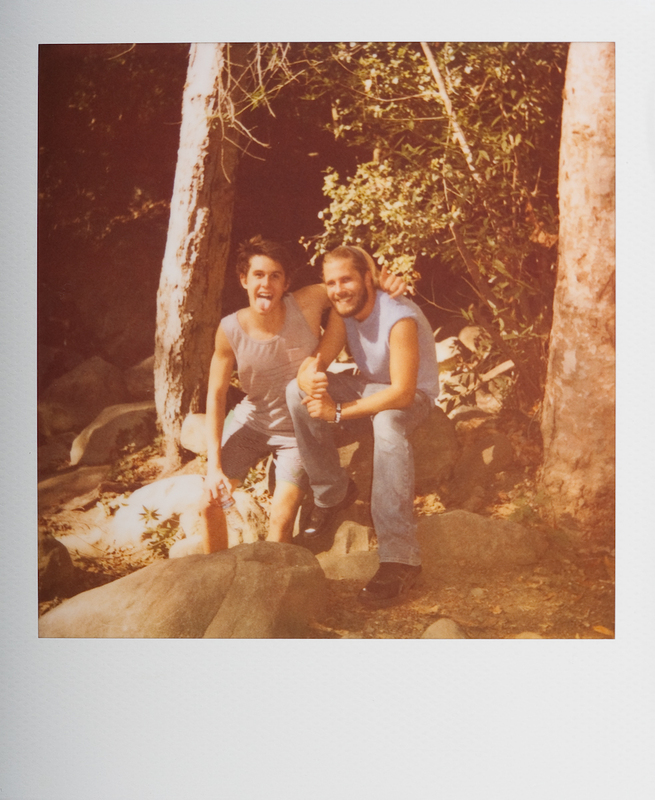 He ventures up to the Santa Barbara, Montecito and Goleta areas to visit his girlfriend Lizzy, who schools at UCSB. He doesn’t mind the commute as he loves seeing his girls but also “both SB an SD are sick areas.” Dave is an avid outdoors kid, he’s a lifeguard and hiking is a must in his free-time. 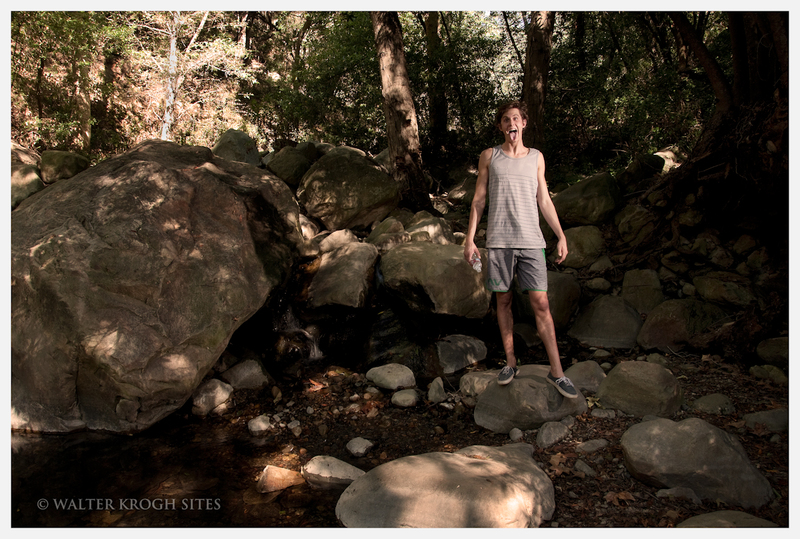 –> Information on Cold Springs Trail & Montecito coming soon! Dave and I up Cold Springs trail in Montecito. While out in California, I was hoping to capture your typical Californian surfer. Unfortunately that did not come to pass. However, when in Venice Beach I opted to attempt and photograph someone just as important to the Cali-lifestyle. 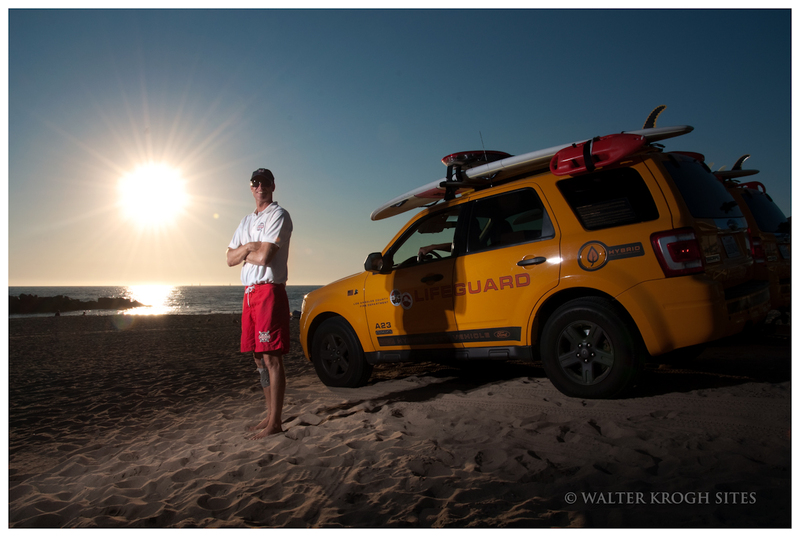 Dave Carter is a 25 year lifeguard veteran who is born, raised and ‘lives’ California. Before becoming a lifeguard Dave taught Language Intervention, where he taught older illiterate people to read and write– he did this for about seven years. Dave retired and returned to what he loved most: the beach and the ocean. “Nothing will ever compare to the north coast” he says, explaining why he chose Venice Beach over many other beaches. He has guarded beaches from Sonoma County to Orange County. The Venice area is a very busy, constantly changing area of the west-coast. With all the surfers, tourists and even the big local skate park, he finds there is always something to do. “The constant flow of EMS calls keeps us on our feet” as he explains that, yes they are emergency calls but that is why they are there and keeping busy is better than anything else. The town also seems to attract hard-working individuals like himself and such, Dave works with a very skilled and dedicated crew. “We are not perfect, nobody is– but we do a damn good job!” Dave says. He had a very humble way about himself and made it a point that he needed to watch the waters as we continued our interview. “This is a unique area, but still only my second favorite place.” It would seem he had a yearning for home but seemed very content with where he was. 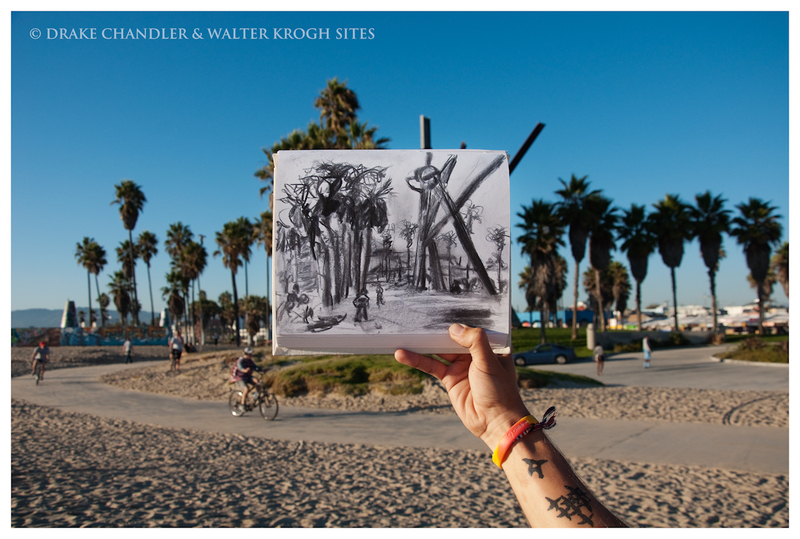 –>Information on Venice Beach coming soon! Dave and I at the Life Guard station at Venice Beach, California. Drake and I caught up briefly while I was in LA. Here, the final sketch to the project. Annie is a Michigan women who came to San Diego to take care of her mother some time ago. After her passing, Annie decided she would remain in this amazing town. “The sense of community is so strong” she says. She doesn’t find a reason why anyone would be depressed or upset in this area– the weather is always nice and the living is truly easy. Annie used to own a farm in Michigan, but sold it when she decided she was going to make San Diego her home. She now lives in Ocean Beach, which is a San Diego community that fits her style and personality– lots of art, great food and amazing people. 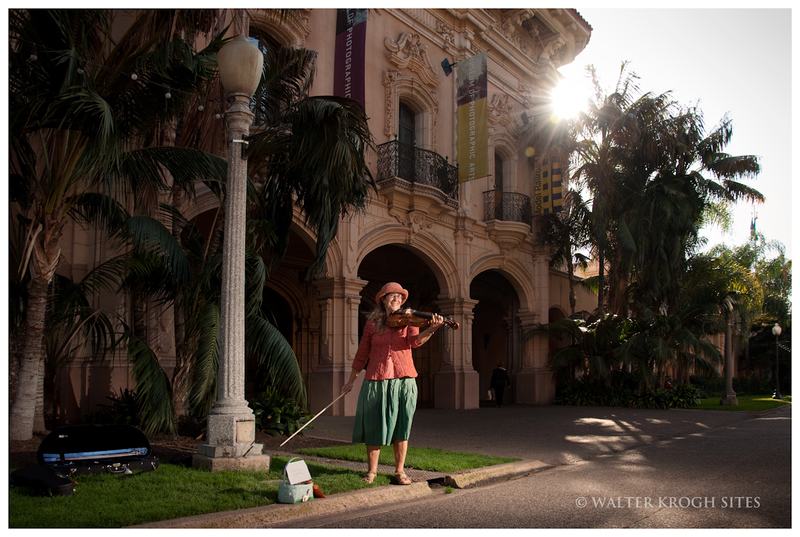 –>Information on Balboa Park coming soon! 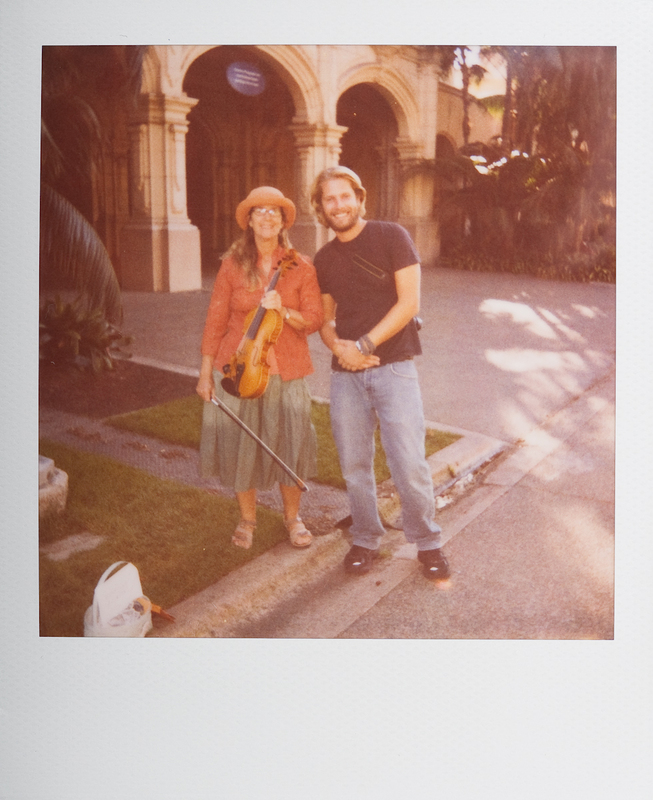 Above, Annie and I at Balboa Park. She was playing some lovely music with a smile on her face that invited me to talk to her and get to know this unique individual. 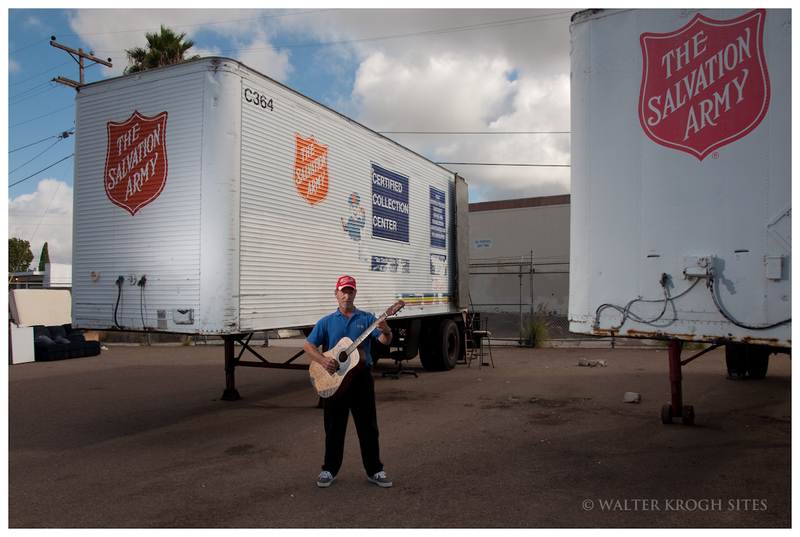 In the process of clearing out my storage unit in Carlsbad, I found myself donating many thing to The Salvation Army. After making four runs to them and delivering car-loads of things I accumulated over the past years, I felt it appropriate to take Darens’ picture. Daren, A fun and friendly individual wondered how many more times I was going to swing by– he was surprised at all the things I was giving up. Daren found himself in a struggle some time ago, attempting to come to terms with his addictions he found himself a great support group and went through the ARC program. He says “It did me so much good” as he begins to explain a bit about his past. Daren worked as a store-clerk at The Salvation Army and now organizes the donation truck, he’s been doing so for a little over a year now. Born and raised in Sacramento, Daren is a true Californian at heart. He’s friendly, laid back and takes a pretty broad view of life and the world. He is a trained dye-cutting pressman and hopes to return to this career once he is sure and comfortable that his addictions and his foundation for life is secured and under control. He seems as if he has made some serious progress and with the closing of this Salvation Army location after 25 years of service he will attempt to pursue his desires and hopes for the future. 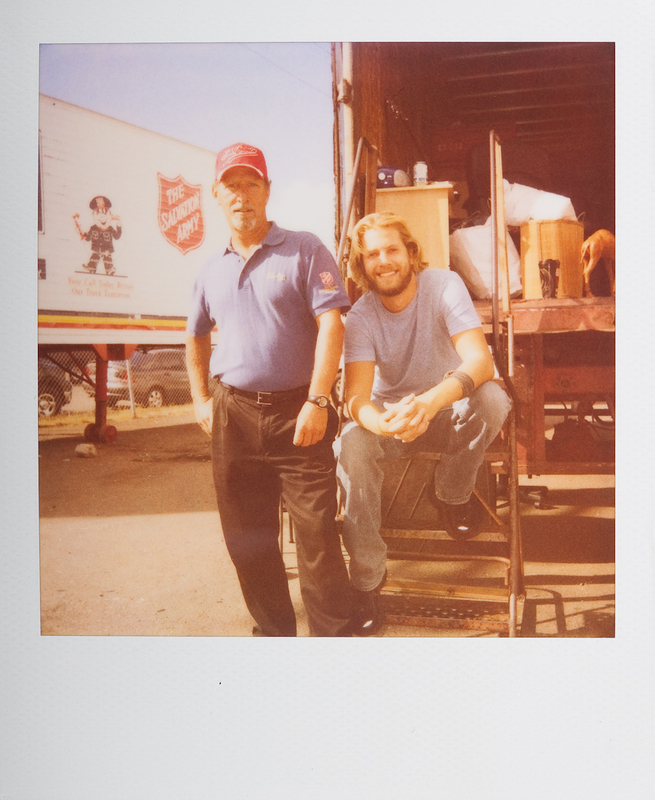 Here, Daren and I hanging out at The Salvation Army donation truck. We talked for some time as we drank some coffee and enjoyed conversing with others that were donating clothes and other valuable things. So, today marks the mid-way point of my trip. Drake and I are in Pacific Beach, San Diego. We have now put about 5460 miles on his car, driving zigzag through the country. Unfortunately, this is the farthest point that Drake will be joining for this trip. He has now found a place to live in Santa Monica, California and will be returning there tomorrow. I will be staying with a good friend here in San Diego for a few days to take care of some loose ends and to empty my storage unit. This will mark the end of my living experience in California, now reaching a solid five years on the west-coast. 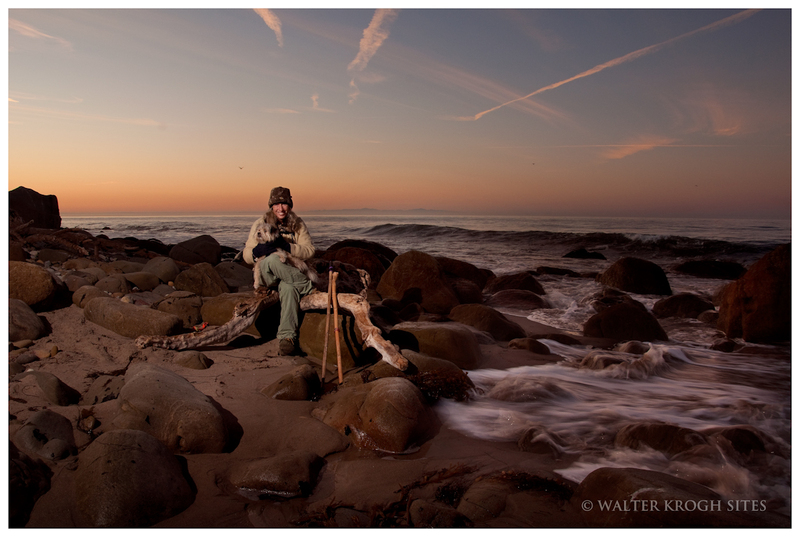 I will begin my return trip to Delaware with a quick stint in LA and Santa Barbara. With the week or so drive back east, I will be continuing the portrait project that has become my life for the past two weeks. Drake and I have met so many unique individuals from all over the United States. We have shared conversations, information and laughs with these amazing people. Traveling back on my own, may prove to be pretty lonely. However, if I give myself something to occupy my time with such as this project I may find myself quite busy. Below, you will find most of the portraits taken so far! Check back frequently to see what’s new and where the trip’s going from here. Thank you to everyone who has shown an interest in our blog! In the nine days that we’ve had the blog running, we have scored over 700 hits. We thank you for the comments, the views and all the support you have given us along the way! Also, thank you to everyone who has taken us in, hooked us up with places to sleep and even fed us some delicious foods, you are the best! 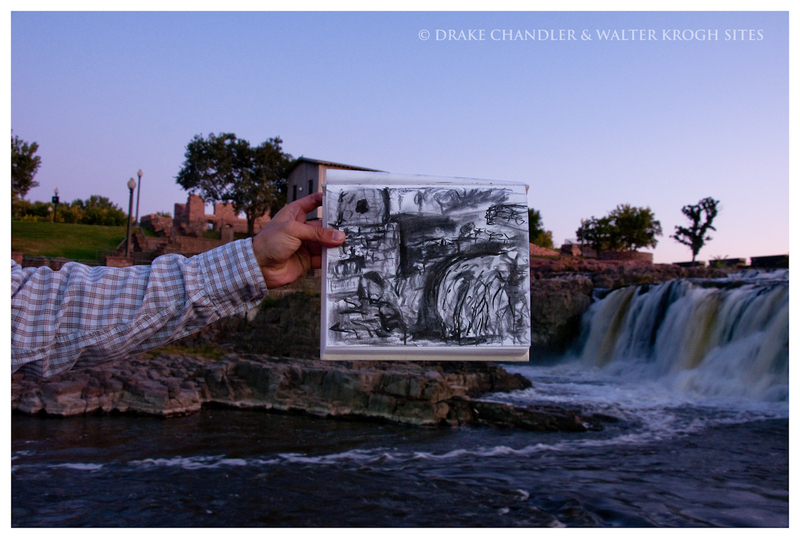 Above: Drake and I at Sioux Falls, South Dakota. 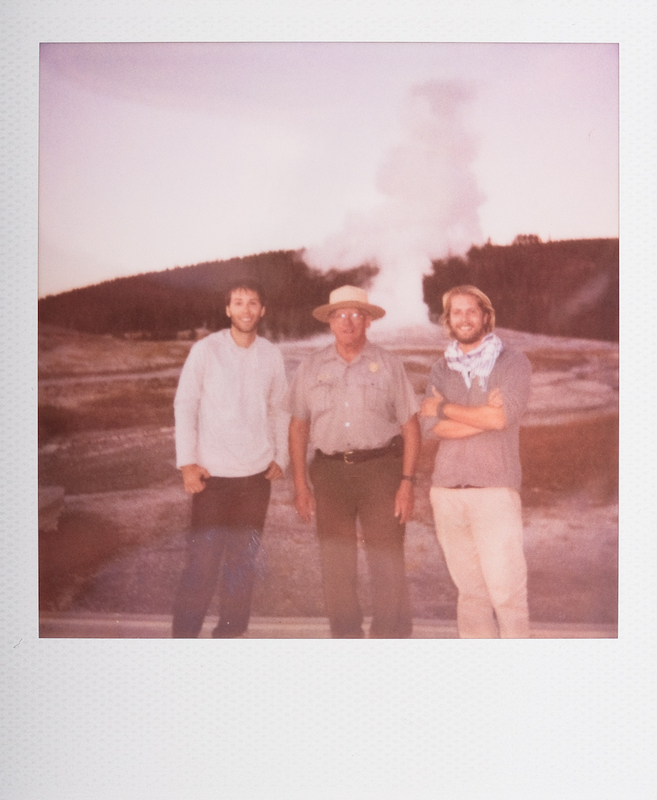 A long time Geyser enthusiast, Jake visits Yellowstone at least one time a year. If work allows, he tries to make his way out as often as possible. 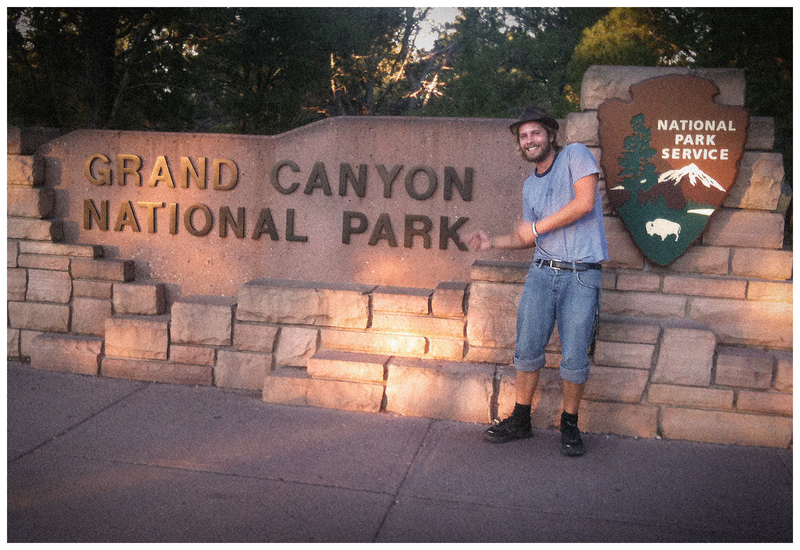 Jake lives in Denver, Colorado and enjoys the occasional drive farther out west. As we were talking, I heard a voice call out over a two-way in his pocket. I asked him whether he worked at the park. Jake said that many Geyser enthusiasts carry 2-ways to communicate eruptions, sightings and predictions so they may be able to witness some of the less predictable eruptions. Jake stays in Yellowstone for about a week at a time and seems to have much patience– he had been sitting on this railing for a while now. Here, Jake is waiting for a small Geyser, named Tilts’ Baby to erupt. Supposedly there used to be a geyser named Tilt, but had been buried many years ago by an event. Jake gave me some excellent suggestions on pools and geysers to visit while on my stay. He also named a few trails that I will need to attempt at a later time. Unfortunately our time here in Yellowstone was very limited, as every stop on our trip has been. It all just seems as if someone placed a five-star dish in front of you, allowed you to take a single bite, then proceeded to remove said dish and make you crave for more. 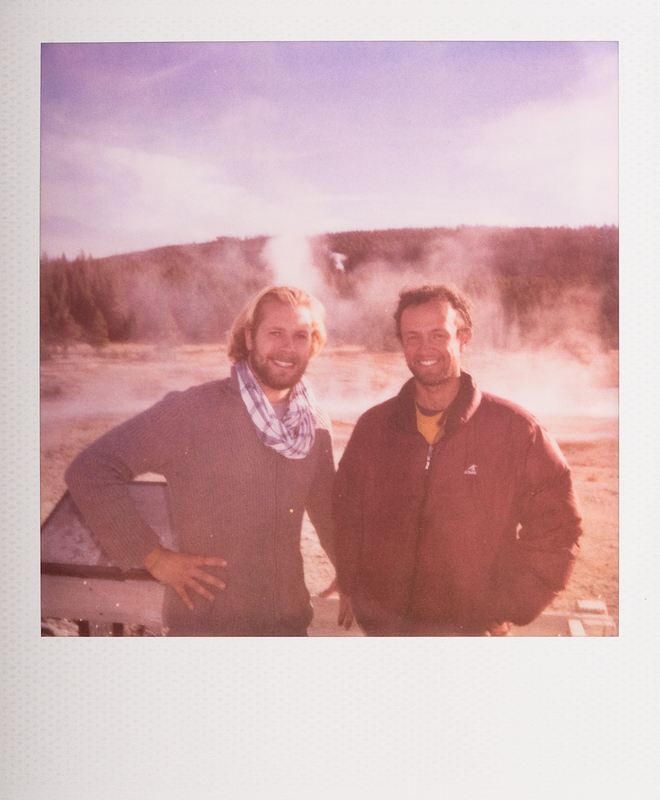 Jake and I at 8am in Yellowstone park awaiting a Geyser eruption. 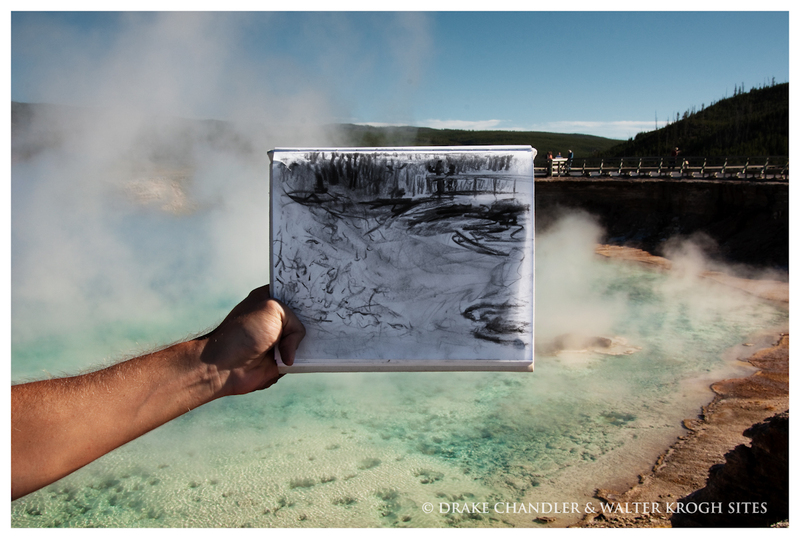 Above at the Excelsior Geyser, We attempted this sketch. Every couple of seconds it would cloud up so much, that we couldn’t see a thing. This also made it more difficult to photograph the sketch within the scene because most of the time we had nothing to connect it to, nothing to compare distance or perspective to. Yellowstone National Park is known for some of the roughest and coldest winters in the continental United States. He told us a couple chilling stories of such times. He made mention to outdoors gear they required during these seasons & preparations one would need to make, just to exit the house. If one didn’t take meticulous care and make some of these preparations, it could be life-threatening. Bill, even told us, that after so many winters spent snow-skiing through the park, he had now lost all feeling in the tips of his fingers. Bill Wise, an outdoors man at heart loves all things ‘nature.’ When he was younger he even bread Black Labs for the Police Departments and Fire Rescue. This being his favorite breed of dog, he loved this portion of our conversation. 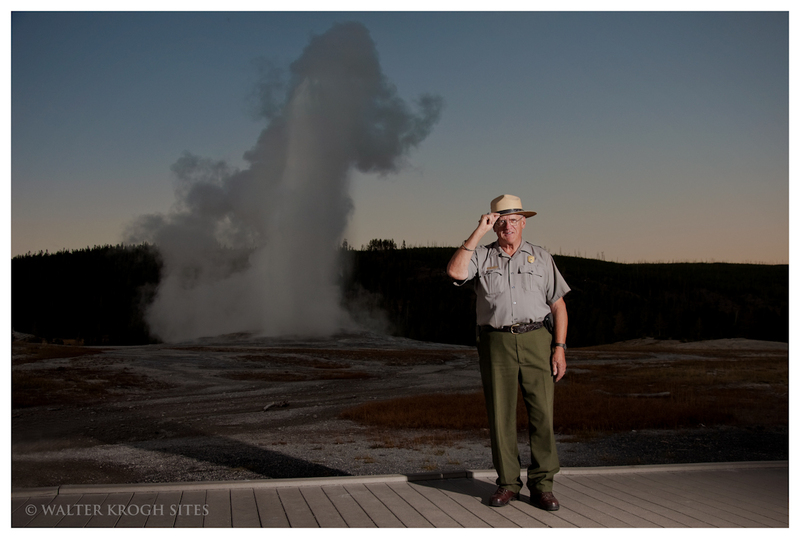 Unfortunately, we were only able to steal Bill away from his duties for about 20min– he was needed back at the Old Faithful visitors center. Bill Drake and I standing in front of Ols Faithful as she erupts. 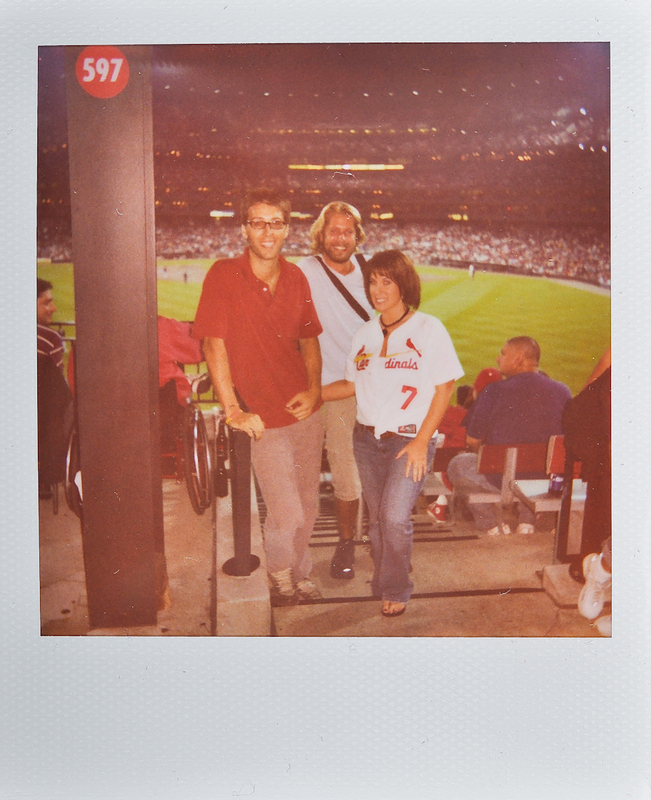 I love this polaroid, it has a dynamic/classic perspective. We Left Jackson, Wyoming early in the morning to start our drive to Yellowstone Park. On our way in we opted to explore the Grand Teton National Park. 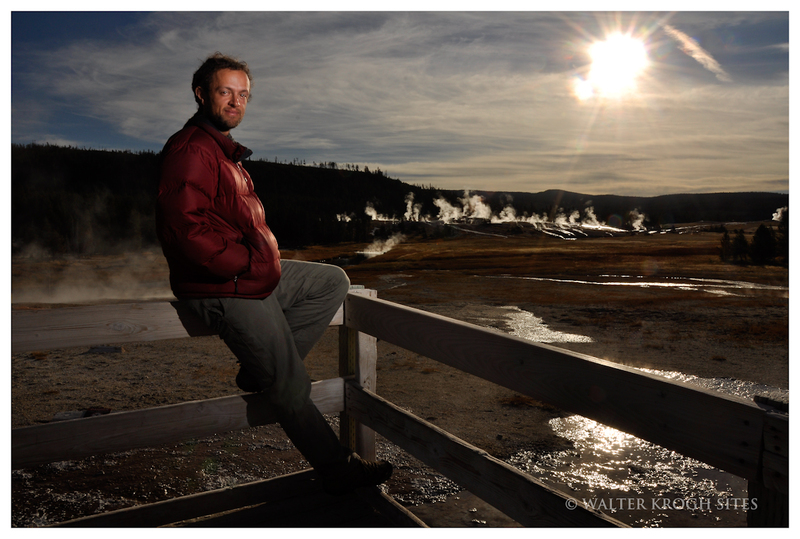 After spending half the day driving around, we began to head towards Yellowstone as not to miss sunset at a Geyser. On our Way out we came across a couple beautiful classic cars. The entire trip thus far, one of the images I was hoping to capture was someone out for a country-side ride in an old luxury vehicle. Right on the edge of the Grand Tetons, we saw a couple more cars in a parking lot. A man was out of his car, photographing it in front of the mountain-scape. Drake asked me if I wanted him to pull a u-turn so I may try to get a picture. A split second response from me was ‘do it,’ so we whipped around and parked the car. Glen, Mary-Lynn and Patty were doing a semi-annual scenic drive. Depending on the location and season, they drive one of a couple of classic cars they own. Among these are a classic Mercedes Gull-Wing and a 56′ Mercedes S named Blue Bird. 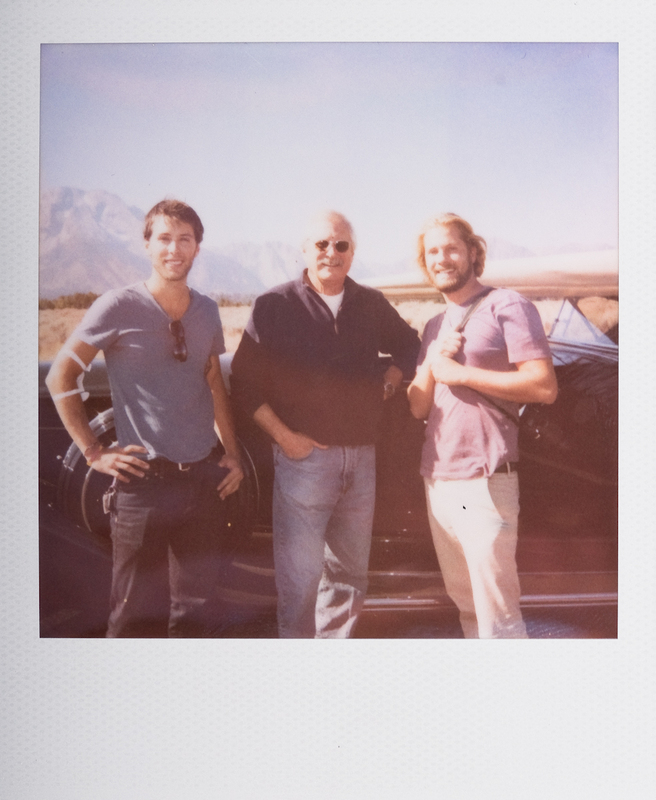 Part of a car club, Glen is one of 14 others that fly their cars out to exotic locations for these leisure drives. 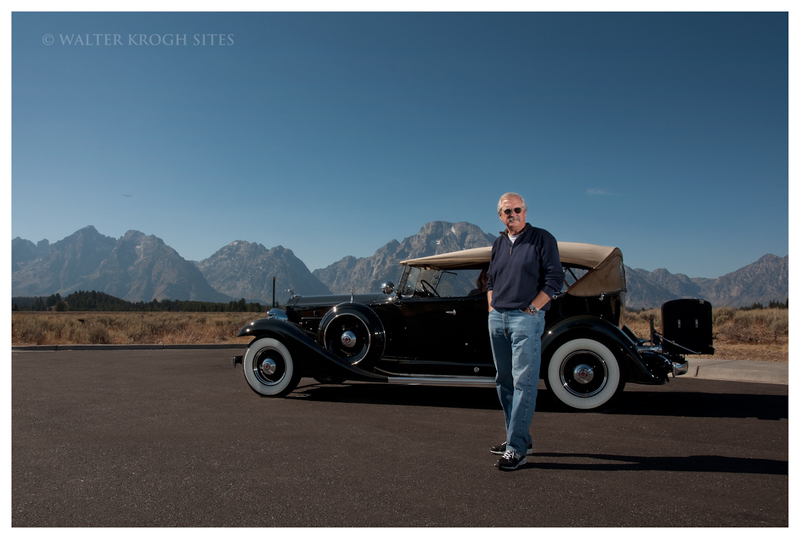 From Seattle, Washington, Glen and his friends from the South Bay Area love their sports and antique vehicles. They had just seen Yellowstone and were now making their way towards Paso Robles, California. 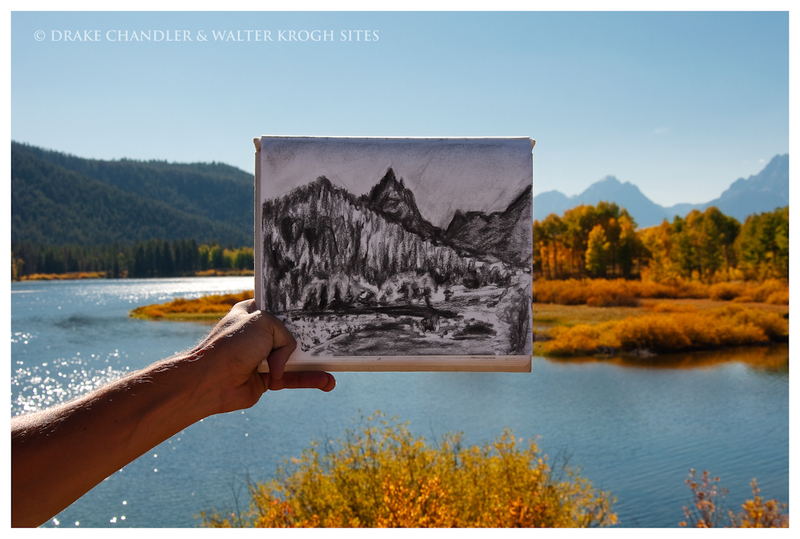 –> Information on the Grand Teton National Park coming soon!!! 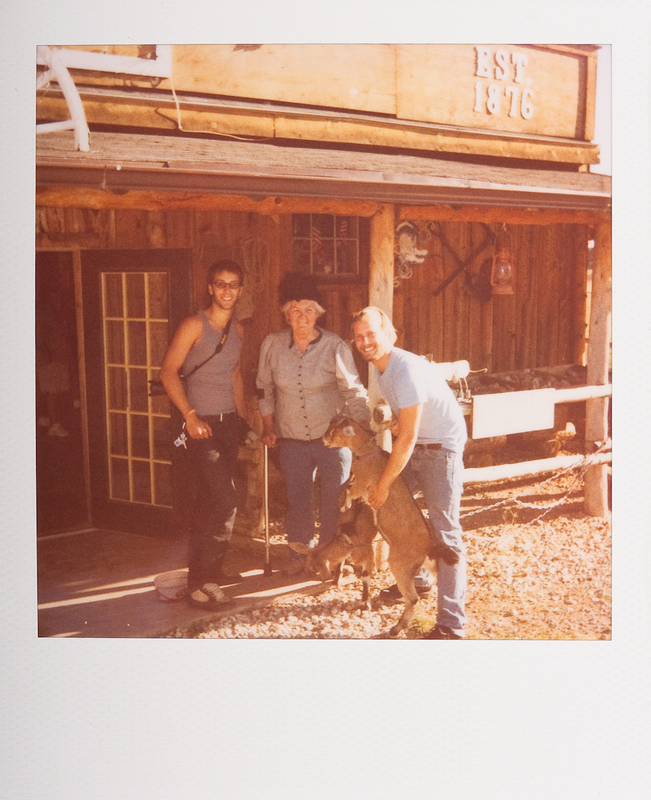 right- Glen, Drake and I in front of his antique vehicle enjoying the most amazing day to tour the Grand Teton and Yellowstone National Parks. We chose this location for two main reasons. The colors here were truly awesome, allowing for additive contrast between the sketch and the country-side. Also, we had a great view of Grand Teton, what an amazing place! 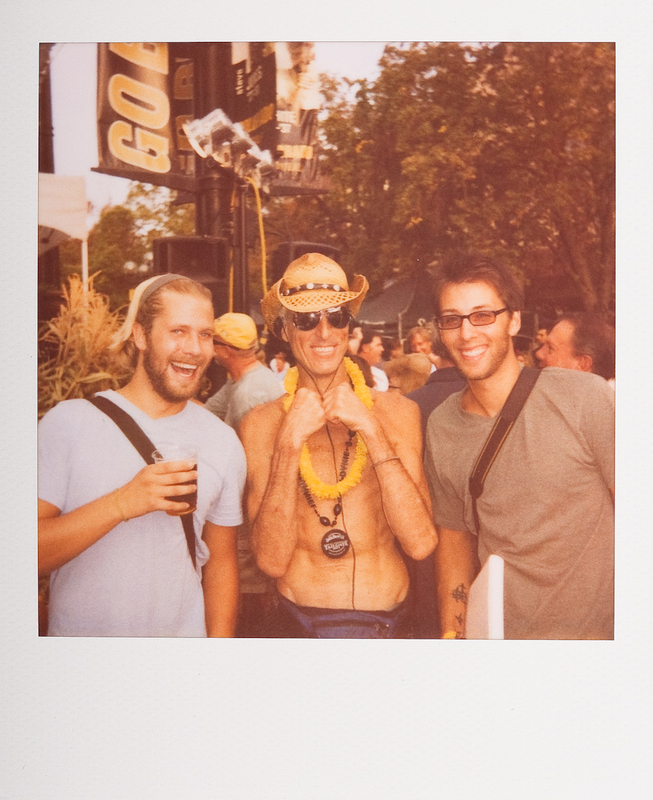 In Boulder we visited a street fair. This was fun because Boulder locals are known to be very friendly and lay’d-back people. We met some amazing individuals that day, and not once did we come across anyone in a bad mood. We even witnessed some other interesting things that proved that even people completely opposite from each other, somehow can mange to live together in harmony. We also had a chance to see a Beatles cover-band perform. They sounded really good and the crowds were having a blast. People danced, laughed and enjoyed a few local brews from Avery Brewery. After driving so much, this relaxing atmosphere was precisely what was needed to re-fuel. Below is a photograph of Richard, a Boulder man who has no last name. He is a man who enjoys to dance and loves the outdoors of Colorado. His philosophy is to not think about the future, or worry about the past. Live day by day, everyday and just enjoy yourself. Richard, who’s lived here his entire life also likes to fix up bikes that the local college students toss out or leave behind when they return home after graduation. He takes these bicycles and after repairs are made, donates them to charity. This was an interesting perspective on Richard, as I was not able to get much information from him. He wore headphones the entire time we spoke, and while he was dancing to the Beatles cover-band– I wondered what it was he was actually hearing. 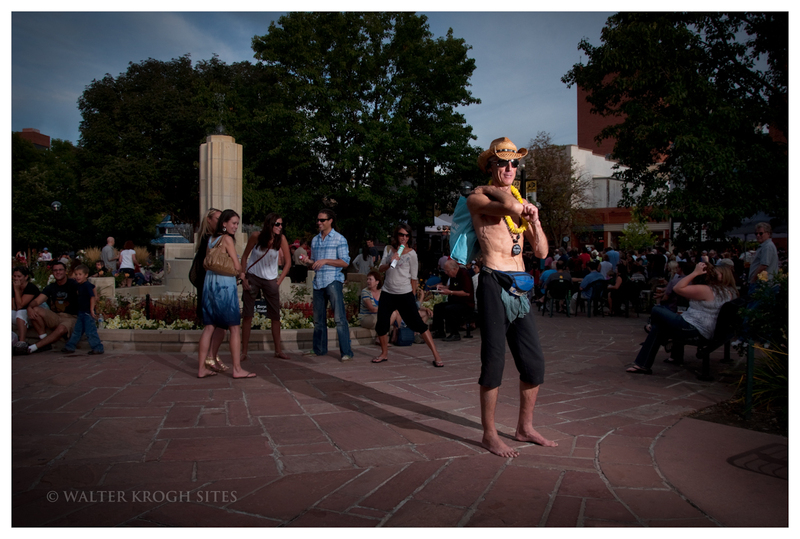 –> Information on Boulder, Colorado coming soon!!! Here a picture of Richard, Drake and I in front of the stage. I’m enjoying a local IPA from the Avery Brewery. You can never go wrong with a great IPA and awesome music! 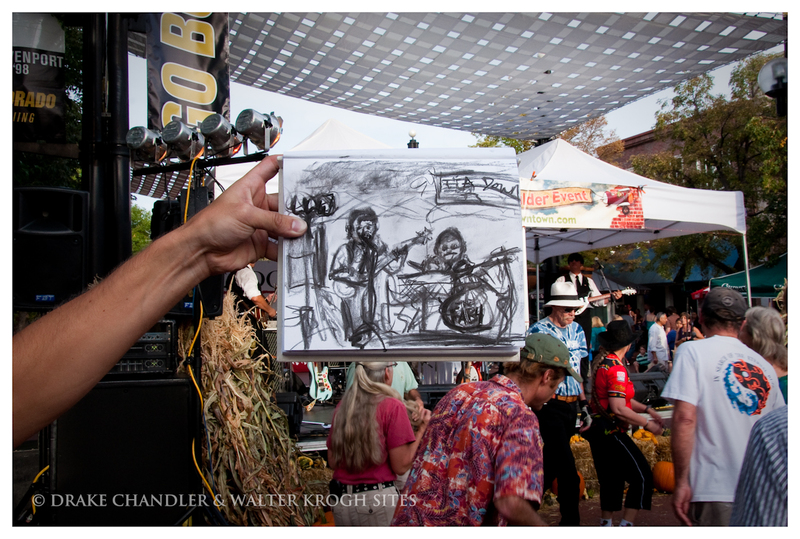 While enjoying our beers and listening to a Beatles cover-band, Drake began his sketch. Here you can see part of the stage and one of the members off to the right. We were lucky that he wasn’t being completely blocked by the gentleman in the blue ty-dy tee, who was dancing in his roller skates. Above, on our way to Boulder, we found this location. We pulled over and relaxed a little while. Again, we had a beautiful day and couldn’t have been luckier! After a relaxing drive through the Black Hills, we arrived at Mt. Rushmore. Here we spent a little time walking the grounds and viewing this amazing masterpiece of American ingenuity. We spent some time enjoying the museum and taking in some of the amazing architectural and sculpting techniques presented there. We had arrived early, so we waited till 8pm, when the lighting and dedication ceremony was to begin. Promptly at 8pm, the lights on the outdoor amphitheatre began to brighten. A lady walked out onto the stage and welcomed the crowd. She introduced herself as Ranger Steph. She followed by separating the crowd into three groups, then had a small competition where we’d attempt to answer a short trivia on our founding fathers and the four presidents seen on the mountain ridge. Afterwards, she spoke for fifteen minuets and enlightened us with much fun yet interesting information. Once complete with her presentation a short film of the Mt. Rushmore history was played on the big-screen. As the film began to come to an end, a patriotic tune began to play as slowly the lights rose to the hillside and began to illuminate these massive sculptures. Ranger Steph, returned to the stage and began by asking the attending veterans in the crowd to please come to the stage for the lowing of the flag and our national anthem. A group of veterans from Florida began lowering the flag as the rest proudly saluted. After the flag was lowered and carefully folded into the traditional triangle shape, it was presented to the Ranger. She accepted the flag with thanks and a salute in return. Gratitude was spoken to all attendees of the ceremony and the visiting veterans. For a short time people took photographs with the ranger and children were allowed to carefully touch the flag. Once some of the crowd dissipated, I began to introduce Drake and myself. 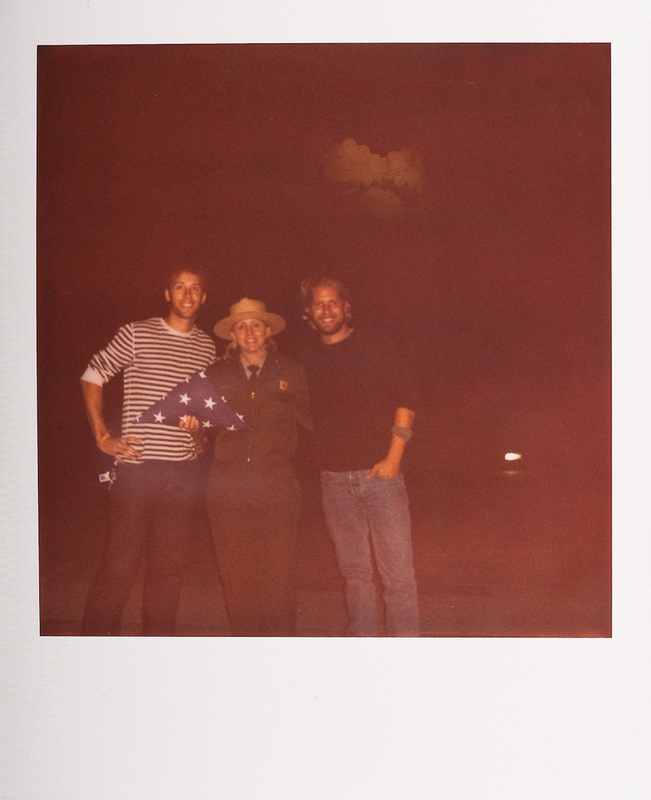 She was excited to have her photograph taken and said, with a smile: “anything to promote the Park Rangers.” We invited her to join us at the top of the amphitheater once she had locked up the stage and returned the microphone. When she asked whether to bring the flag, I found it most important she did. Stephanie Acheson, born and raised in Virginia. She has always been a history buff and believes that without our history, we wouldn’t have the present or the future. It is all shaped by things that have already come to pass. 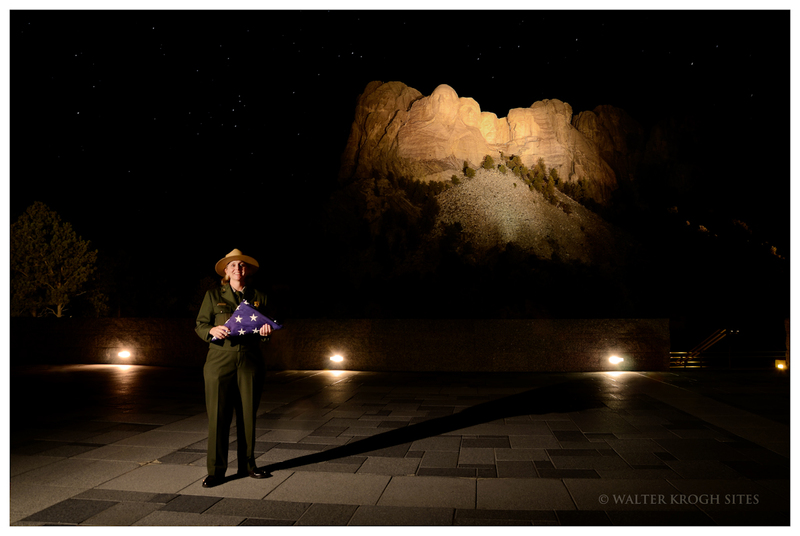 Stephanie has been a Park Ranger since 1998 and has worked in many different parks around the country. Her deep understand of our Nation’s history and soul is what brought her to Mt. Rushmore, a little over a year ago. She loves working as a Ranger and enjoys passing on our County’s legacy to the visitors that fill the theater. The winters here can be pretty fridge’d. When asked how she liked living there year-round she answered by just saying: “well, when it begins to rain baseball sized hail…” Other than that, Stephanie loves the people who live there and finds the quality of the State Parks to be generally better as you venture west. She was a fun girl who liked to joke a bit here and there. We had a good time talking and setting up this picture with her. Stephanie, Drake and I posing in front of Mt. Rushmore holding the folded American Flag after the lighting ceremony. Here at Four Mile Village, an old ghost town and tour, we spent an hour or so walking and taking pictures. On our way out I asked the young man working the register if he’d be interested in having his picture taken, he agreed but suggested we talk to his grandmother Mary. Matthew Krogman went and fetched his grandmother. She was excited to be a part of the picture and welcomed the conversation about her world. Originally from Pipe Stone, Minnesota, Mary has been living on the outer edge of Custer County for 17 years now. She’s been running Four Mile ever since. Mary had a vision of an educational set-up that allowed children to see, touch & learn from what the old-west may have been like. It took us about an hour to walk through, there was much to see! Mary sported a black hat with feathers and a chewed at a cigar, below you can find her at the entrance to Four Mile. The two goats just hang out in the front area, should anyone choose to have their picture taken by the ‘Wanted’ sign. This was a great experience and Mary was tons of fun to be around, just such a friendly & happy individual! –> Information on Four Mile Village coming soon!!! This shoot presented a unique challenge, we had to get the goats to stand where we wanted them to. We used food to kind-of bribe them and it worked, after some time. 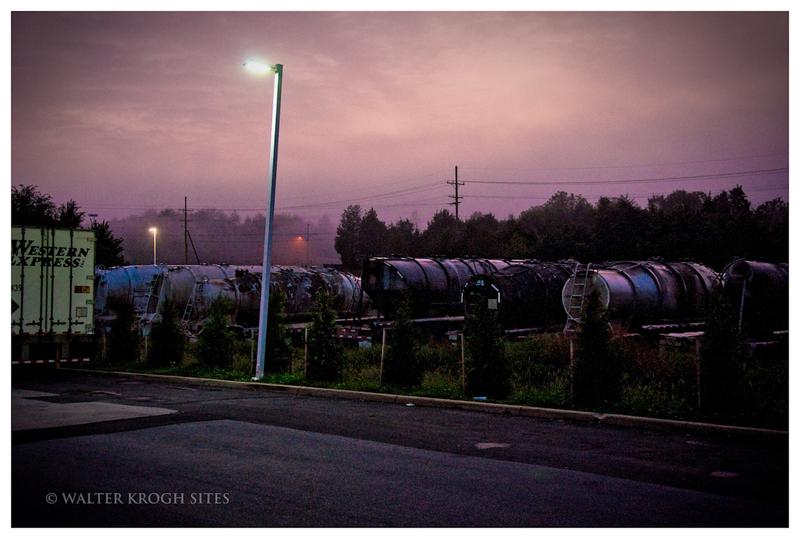 This is one of my favorite sets of images thus far. We left Four Mile and began our drive towards Mt. Rushmore. We took Rt16 that led us on a beautiful drive through the Black Hills of South Dakota. Since this time of year is perfect for such drives, the fall colors were as vibrant as can be. On this stretch we encountered our first Deer, and a lonely Bison. Off in the distance after climbing a small mountain and winding down the other side, Mt. Rushmore became visible. At one point a small tunnel perfectly framed the sculpture off in the mountain side, this was a most fantastic perspective! Our first stop took us to the Reptile Gardens, here we met Lance Fuhrman. Lance was hosting the snake show, here he showed us some key snakes from this Burmese Python to a Rattlesnake and more. After a short Q&A, we proceeded to interview him about his career working with reptiles. 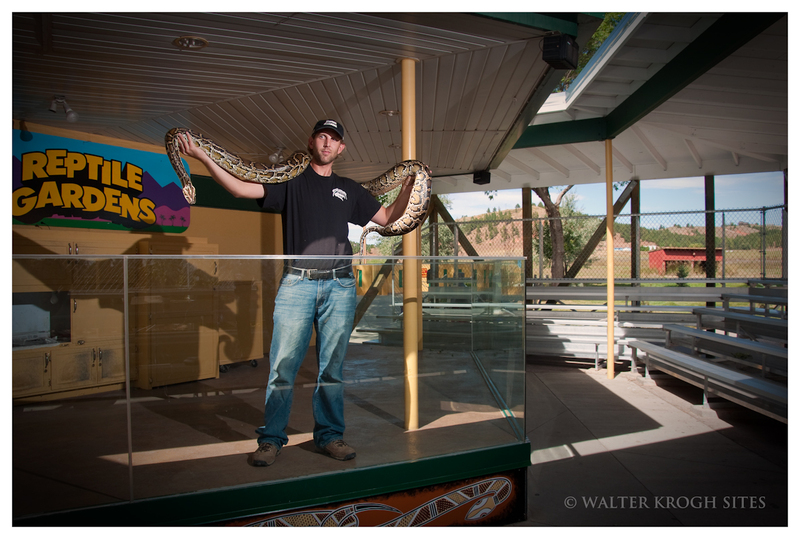 Lance, being a local to the Rapid City are has been working at the Reptile Gardens since a teenager in 1995. Lance never thought he would be working a job that my get him bit or slowly suffocated as dinner, but at that age– it was a job, and he wasn’t going to be picky. After a few years of proving his skill and tactful understanding of these creatures, management offered him the opportunity to train for the shows which also included the alligators. Lance mentioned, that ‘yes’ he had been bitten by a few of the snakes in the past, but had been fortunate enough to never get on the wrong side with a venomous snake (I believe someone promptly knocked on some wood.) 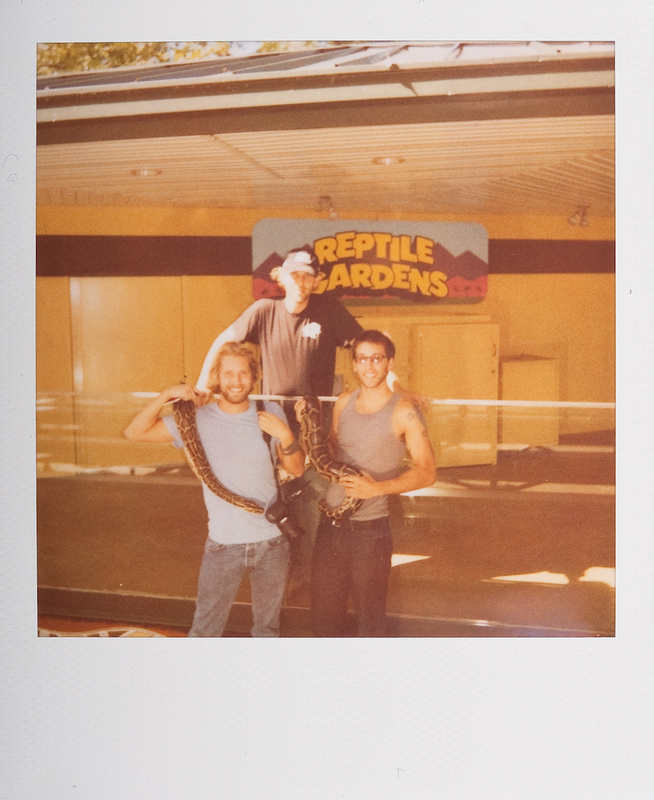 He now does both the snake and alligator shows and “rock’d it.” Lance seemed to enjoy what he did, he certainly was very knowledgeable and presented much in site into the anatomy and lives of these great reptiles. –>Information on the Burmese Python coming soon!!! –> Information about the Reptile Gardens coming soon! 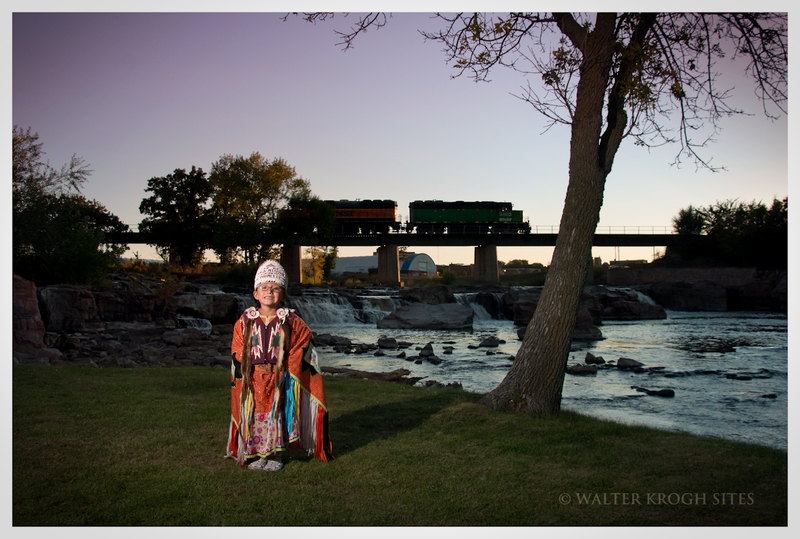 While walking around Sioux Falls, I came across a family taking some pictures of a little girl dressed in Native American clothing. As always, my interest peaked and I was promptly engaged in conversation. The little girl’s name is Lesleen, which is a combination of both her mothers’ (Eileen) and fathers’ (Les) names. They live on a reservation about 45min from Sioux Falls in Mission, South Dakota. 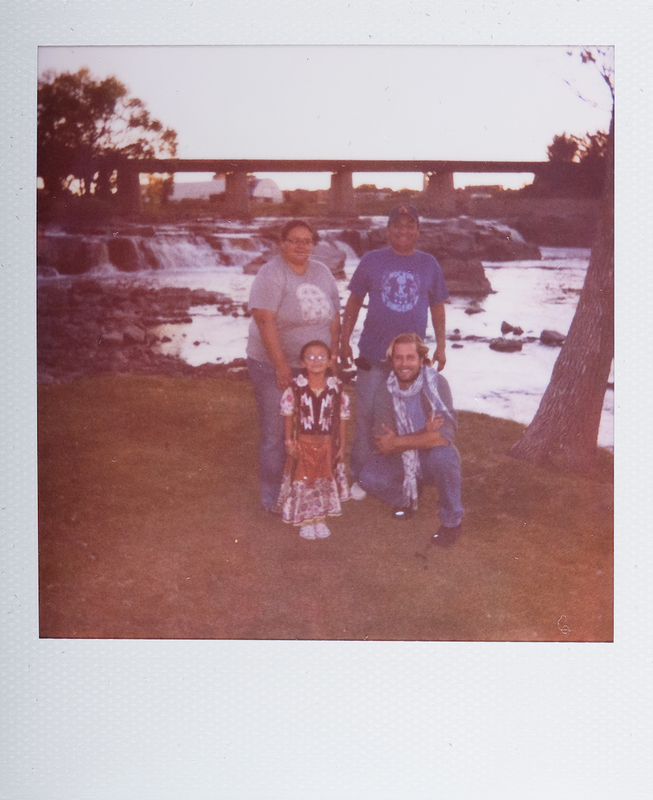 The family was in town for an art market and Wacipi Pow Wow. This Pow Wow is a celebration of spirituality, nature and tradition. It brings Native American Peoples from all across the country together for a fun-filled time of dance, music and excitement. Lesleens’ father Les is a singer and performs as part of the Pow Wow. Lesleen herself is all dressed up for a little contest. She wears a crown (hat) that represents her community and will compete in ‘Little Miss Parmelee.’ Here, Lesleen will showcase traditional dance techniques. She is an adorable young girl, and I’m sure she blew everyone away! 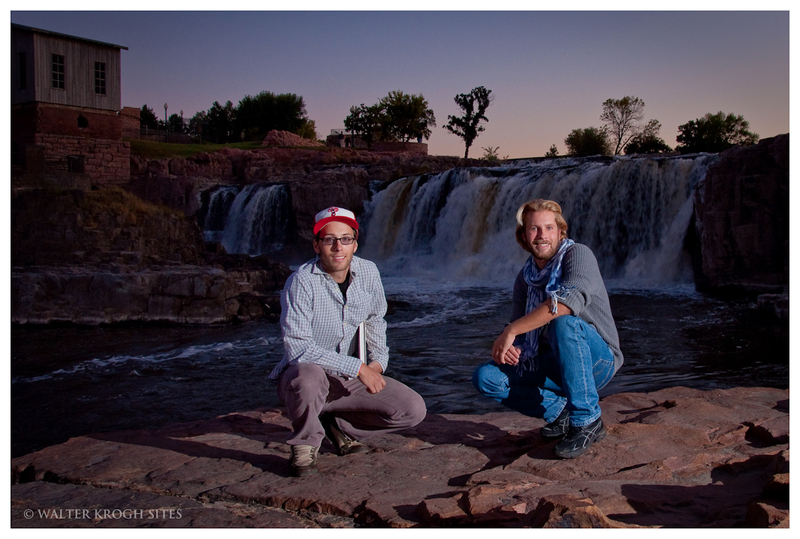 –> Information on Sioux Falls Coming soon! Above, a Polaroid of me with the family. They are friendly people and were very open to helping with my project. Since Drake was out taking pictures elsewhere, this is the only shot he hasn’t been a part of. 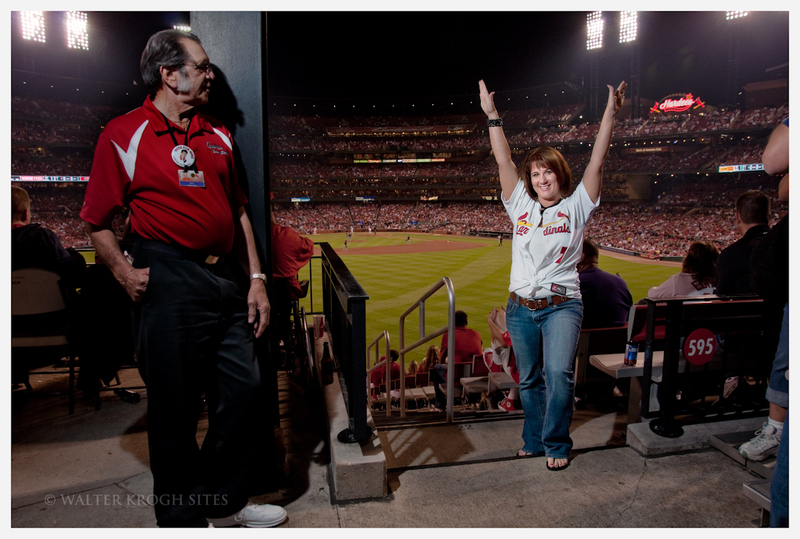 I actually had the father of the girl hold the flash for me as I took her picture. Just goes to show, one can find a good assistant anywhere you go. Here, a nice perspective of Sioux Falls. We liked this view because it had a few man-made structures, and the flowing water together. The sketch-pad is actually blocking another falls in the background but therefore Drake has it drawn onto the paper instead. Tony just returned from serving his Country in the military and being stationed in Afghanistan. He came home and asked his love to marry him– she naturally said yes and now they have their wedding date set. She moved to Sioux Falls for here work at Scheels, he followed to be closer to his new fiancée. They seemed like a happy, loving new couple and we wish them all the best! 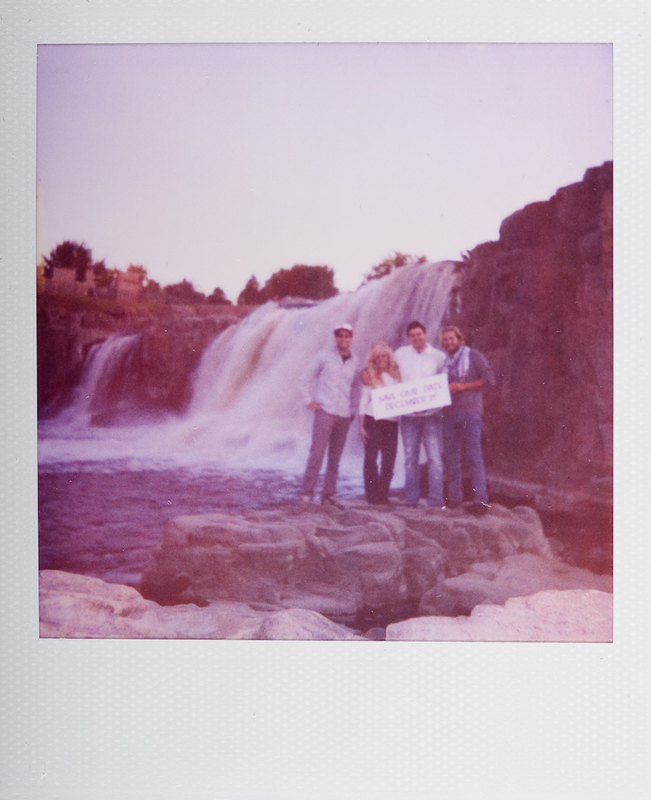 Tony, Lindsay, Drake and myself standing out at Sioux Falls. Here we felt this scene was a great representation of what most of the United States looks like. Lots of farm land, corn fields and as you move west, wind-farms. Since we are supporters of alternative energy such as sun or wind, we wanted a sketch of this. Here, you can see nature, farming and wind-energy all come together– a significant importance for this country. 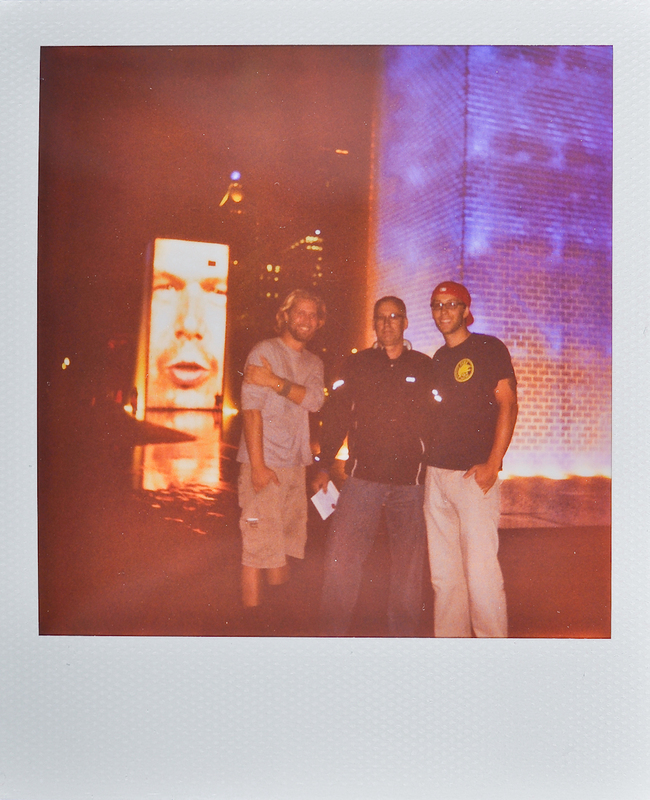 Dave Robillard was visiting Chicago like us. He works for a background screening company and is in town for a business meeting. His hobby and passion is photography, so I felt it fitting that I would capture at least one other traveling photographer as part of this project. Dave’s inspiration with Chicago is easily understood. Like myself, he enjoys the architecture, the night-time lighting and cityscapes. Dave was capturing some time-lapse exposures for his project. 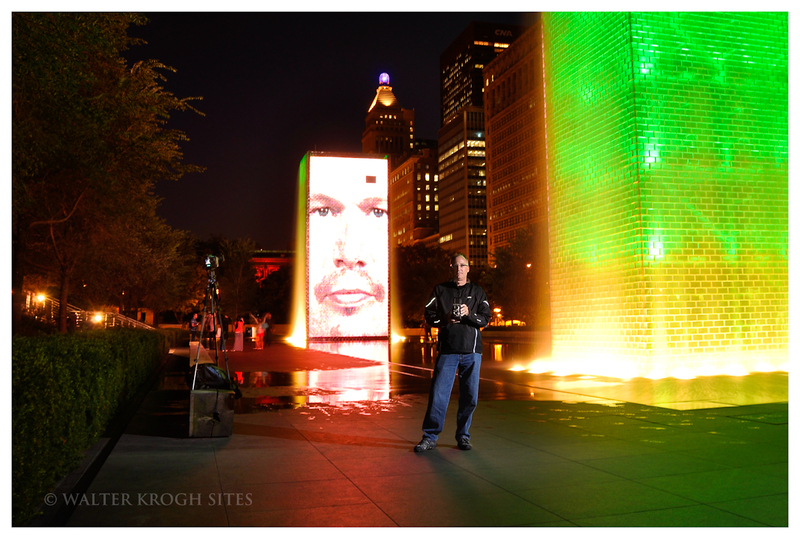 I had seen him earlier on shooting elsewhere in Millenium Park. He also mentioned to look him up on flickr (search his name)…So, go ahead and have a look!!! We didn’t have much time to talk to Dave– our meter was running out and dave needed to return to his project. –> Info on the exhibit seen in the pictures coming soon! A picture of us with Dave in Millenium Park at about 7:30pm. 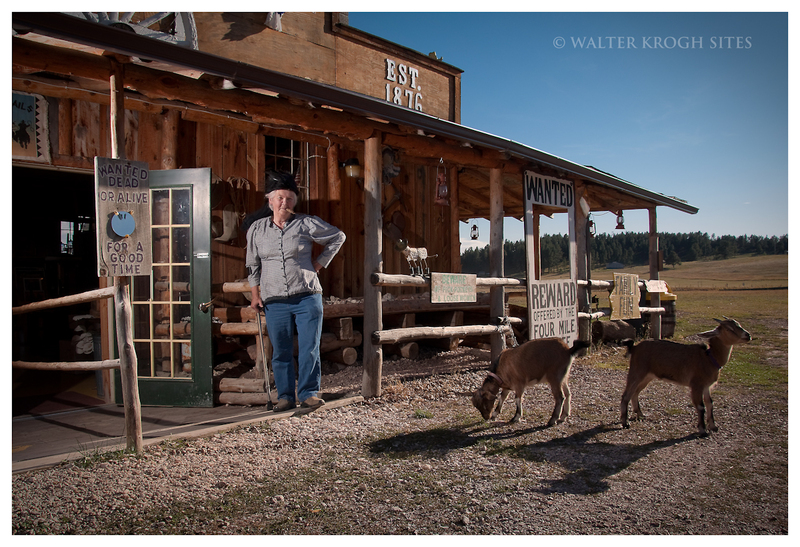 After photographing the town a little, a natural hunger began to grow so we ate at a pretty good Italian Restaurant in downtown, drove back to the hotel to prep for out next drive– to the Black Hills of South Dakota. 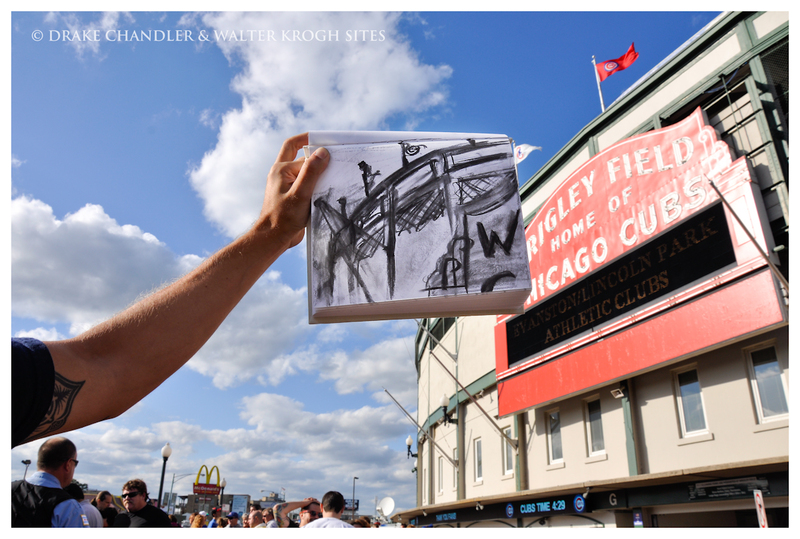 A classic park deserves a classic drawing, here we chose the front of the stadium with its famous Wrigley Field sign. The clouds in the background gave it a dynamic feeling that wouldn’t have done it justice without– what a place to be! The entire block surrounding the stadium is actually called Wrigleyville and hosts an array of pubs, restaurants and sports bars. We visited one, that had their own micro-brewery contained within. It was called Goose Island Brewpub and served up a nice beer! Oh, yeah: the Cubs played the Brewers and won 6:1!!! –> A brief history of the stadium coming soon! This perspective was perfect because it had a neer unobstructed view. Also, we were able to capture a couple of fans in the foreground. 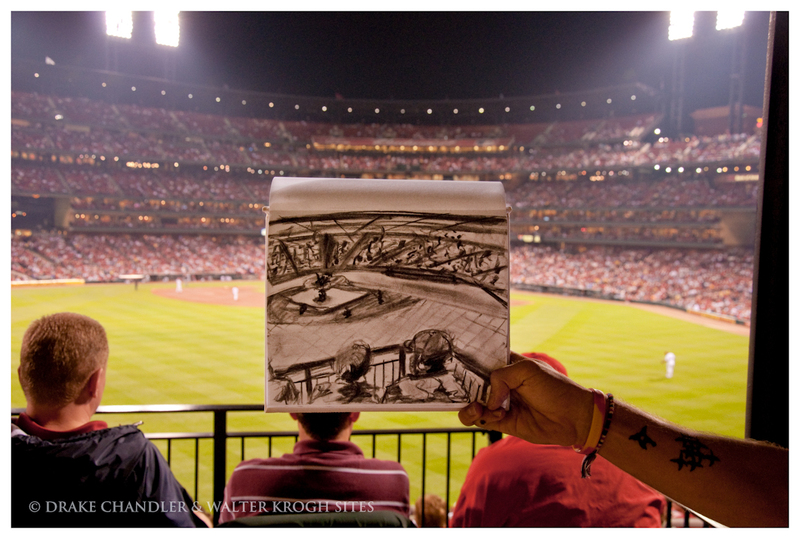 The Cardinals stadium was new, yet built to resemble a classic stadium. The red brick style architecture up against the green grass boasted perfect contrast. Above we are at the Gateway Arch in St. Louis. Unfortunately, this was all we had time to see besides the ball-park. We woke up hours behind schedule, and it was looking more and more like we were going to miss the Cubs game in Chicago all together. So, Drake made his sketch and we hit the road once again. 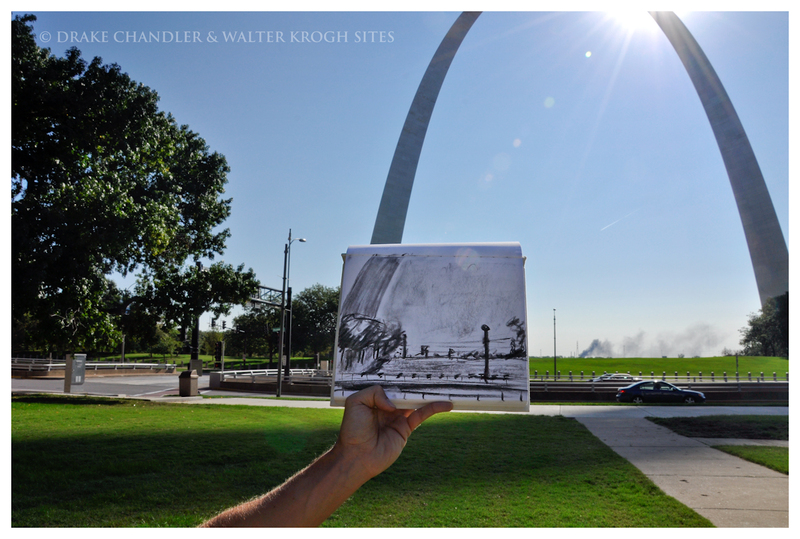 The arch was built in commemoration of the westward expansion of the USA. It measures 630 feet and is by far the tallest man-made monument in the United States. It is located on the Mississippi River and is clearly visible from far away as you begin to enter the city. Standing under it had an almost dizzying effect on the eyes, It’s so large and the material reflected so much sunlight it almost hurt. We wish we could have ventured to the top, the view of the Mississippi and the city would surely have been amazing. Arriving late to Nashville, Tennessee we were invited to join in on an enjoyable local evening out on the town, the next morning we returned to attempt our luck. 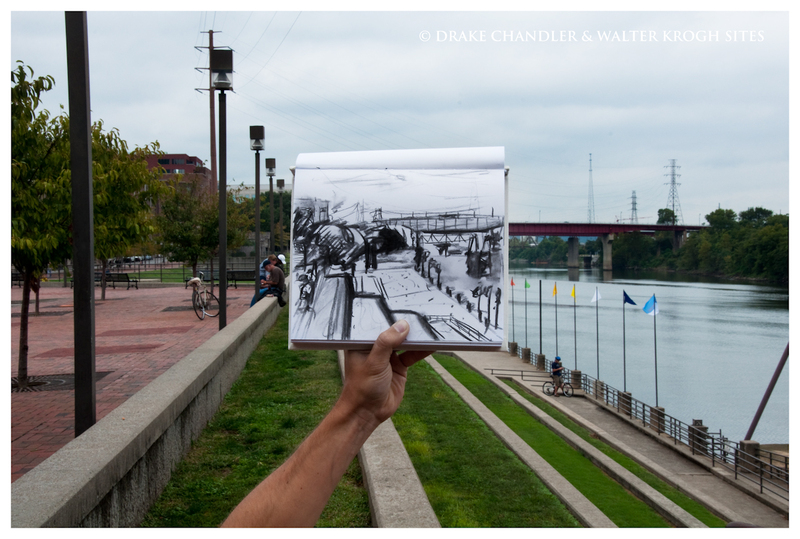 We met a gentleman, who actually approached us as Drake was creating his sketch of the river. 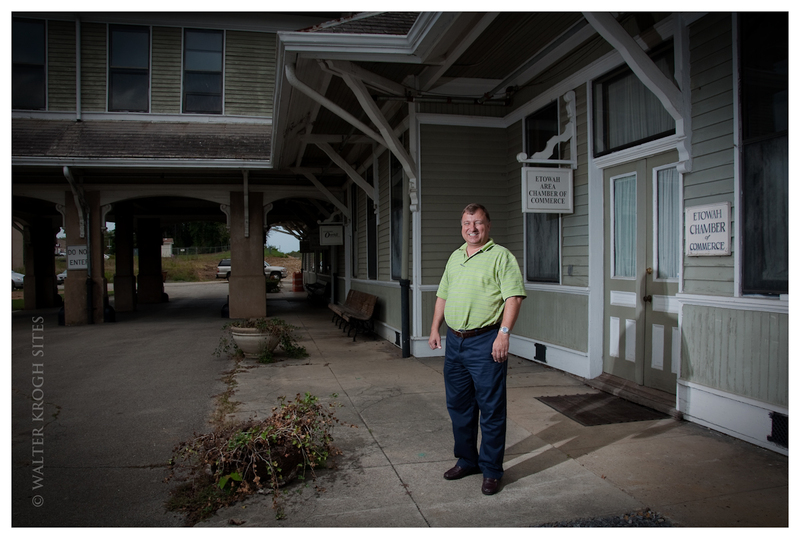 Gregg Ellis, who grew up in Santa Barbara, California– the last place I spent an extended stay at. Gregg, a musician is currently enjoying the local scenes, and in turn has found himself a new home. He has been local for 14 months now and says “People here are most inviting, not like other cities.” He seems very content with his current place in life. Gregg grew up traveling the west-coast living in Reno, Lake Tahoe and many other places. After some time, he naturally met a girl, got married and moved to Cape May, New Jersey. After a great time on the east-coast, He and his wife went their separate ways and he picked up some of his travels. An unfortunate passing in the family moved him to Nashville to take care of his brother. 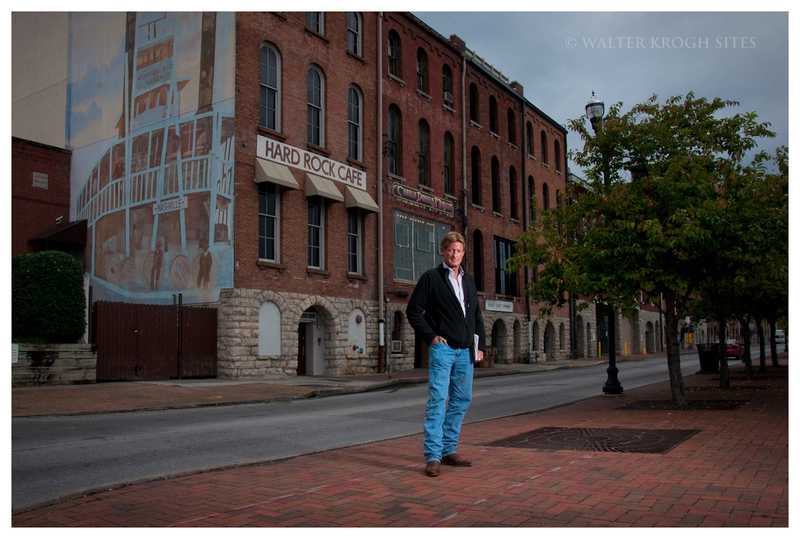 He now mingles with the locals and enjoys the town for what it is: The musical heart of America. After spending a little time hanging out and talking to Gregg, he suggested we look up a friend of his that lives in Santa Barbara. He passed his info on to us and I’m sure once we hit Santa Barbara, we’ll give him a call. We had a great little conversation and then began our trip out towards St. Louis. Above, Drake and I with Gregg Ellis, in front of the Hard Rock Cafe. We chose this location because of the leading lines. We felt the perspective and direct attention to the sketch worked as a perfect adaptation. 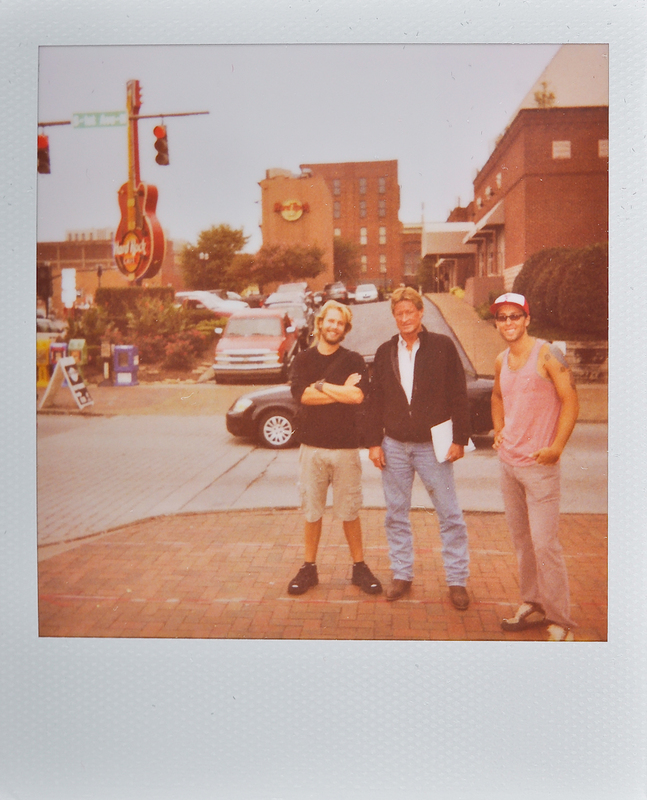 We wish we had more time in Nashville, the people were all very friendly and open. 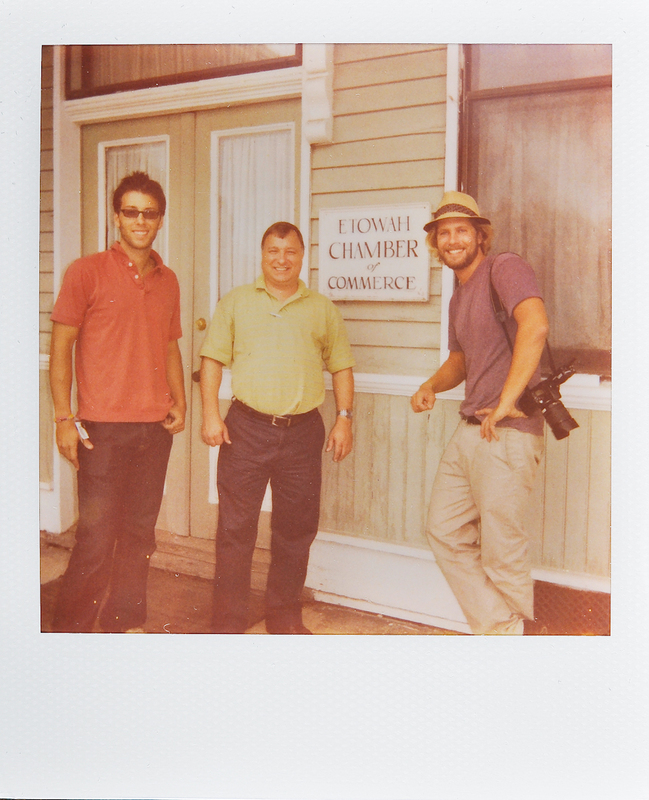 Shortly after spending some time talking to Joe Guy and coming to terms with his busy world, we ventured our way to the Chamber of Commerce in Etowah, Tennessee. Here we were introduced to a gentleman by the name of Durant Tullock. 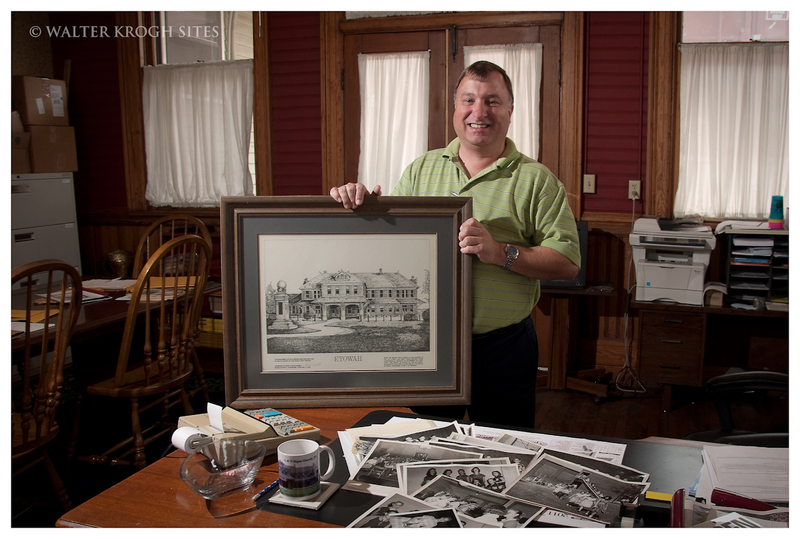 A born and raised local man, Durant runs the Museum and Camber of Commerce. Well, now for a little history on Etowah. The town was founded in 1906 as a mid-way station between Atlanta and Cincinnati. The L&N (Louis & Nashville) railway required a place to service their cars & change work crews. A space in McMinn county was bought up and a new town was established. Etowah, also, is the only town that still offers passenger tours on their ‘historic loop’ up into the hills that was built back in 1898. One can only imagine what it took to walk into the country-side, plan a railway and carve out a path nearly by hand. Etowah, in it’s 100 plus years of existence has made a name for itself as a wholesome friendly town were everyone knows and respects their fellow citizens. Above, a Polaroid of Durant Tullock and us in front of the Etowah Chamber of Commerce. Today we met our first individual. 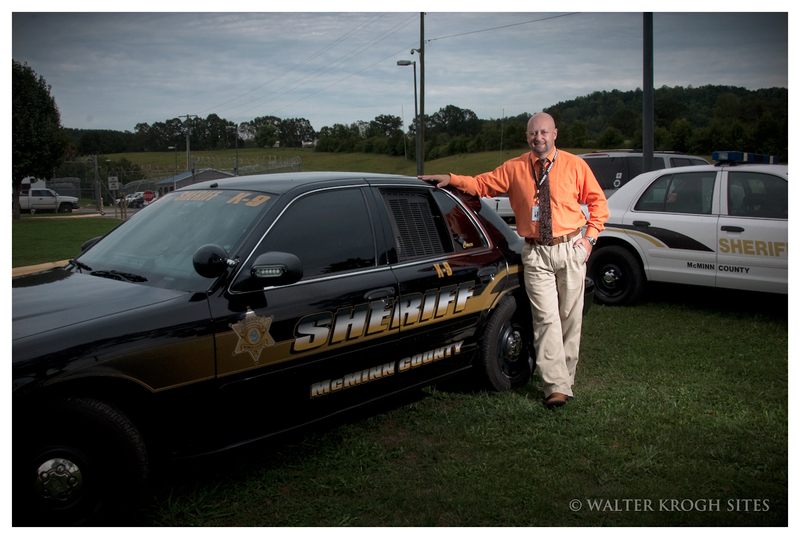 Joe Guy is the Sheriff of McMinn County, Tennessee. 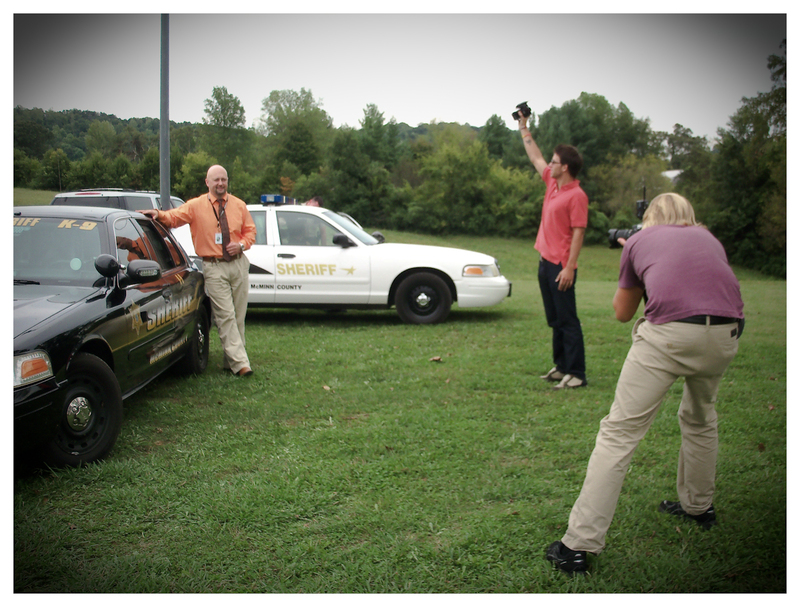 We went to the McMinn County Correctional Facility, located in Athens to interview and take his picture. 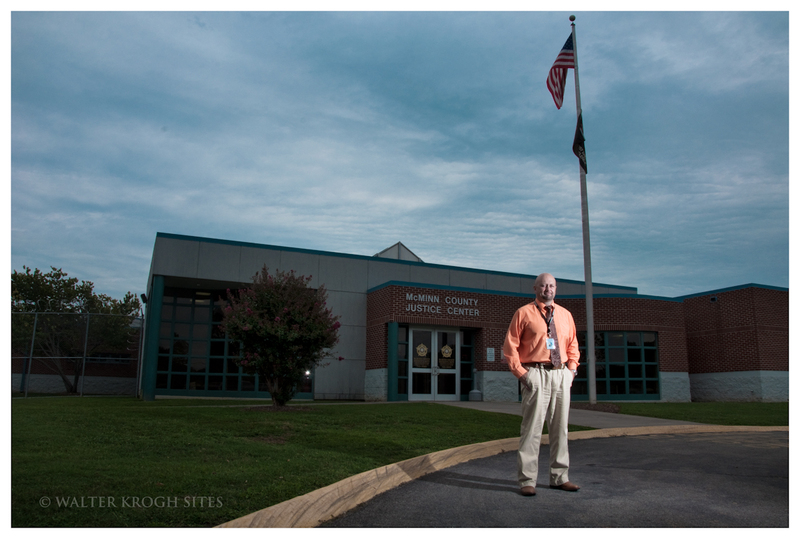 Republican, Joe Guy has been the Sheriff to McMinn County for nearly three years. Formerly, he worked as the assistant to the County Mayor. After some years of being a local individual and living with the people, he chose to run for Sheriff and join a somewhat different perspective of local government. Since being elected as the new Sheriff, Joe has made a big difference as a local and trustworthy official of the law. One of his bigger accomplishments has been his job to control and minimize a huge problem to his area. McMinn County has had an unfortunate issue with a drug that has swept the nation as one of the most destructive and socially damaging substances ever created. 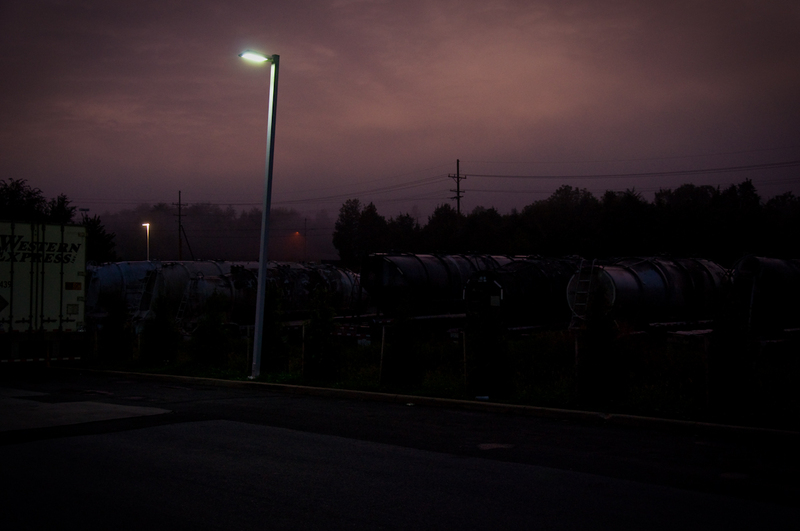 Methamphetamines have created a social unrest and has hurt many communities around the country. McMinn county has felt it worse than many others. knowing that they had one of the highest percentage of users and cookers, Sheriff Joe Guy knew he had a job ahead of him. With this in mind he was positive and passionate in the fact hat he was going to make a difference. After working diligently to control the creation and output of this deadly substance, the locals have seen a dramatic decrease of 30% to 40% of available meth. In the world of drug-abuse and sales, this is a huge success. He now continues to help balance this with the help of the locals that care to clean their town and become a wholesome community once more. Joe Guy has also done many other noteworthy things in his community. He has written a book on McMinn County history, which was very interesting. It is formatted from a selection of years worth of articles written in a local newspaper. When asked about his new position and whether he enjoyed what he was doing, Joe responded with ‘This has been the best job I have ever had.’ He said this with honesty and a bright smile, signifying his love for his community and fellow man. Their pride and courage still are found. To wear their Badge of Gold. Above, you can find our first Polaroid photograph of Drake and myself with Joe Guy outside the correctional facility in Athens, Tennessee after taking his portrait. Before we get into today’s project, I would like to explain a few things about the style of the portraits captured. Some time back, when I was interning for a very talented photographer in Santa Barbara, I had the opportunity to witness the creation of a very interesting project. Eliot Crowley, my mentor at the time, would travel this road north and meet interesting people along the way. He would talk to them, get to know them a little and ask if they wouldn’t mind being photographed for his project. I found inspiration in these ideas and the way they were captured. A few year later and with the upcoming travel opportunity, I decided I would attempt a similar but not precisely the same style project. I opted to use a few similar shooting techniques with a couple personal adjustments. In my vision, the lighting would be about 45 degrees of camera axis and should be a harsh light source– allowing for a pool of light to bring the viewer’s attention to that individual. Also, I wanted to include some words on these people and the area we were currently in. With these modifications, I hoped to create something a little different yet more unique to my capture styles. Well, this story began a few years ago when Drake wanted to visit me out in California. He planned a trip and stayed two weeks traveling with me and enjoying the weather. The following year he scored himself an internship at Zoic Studios in Los Angeles. 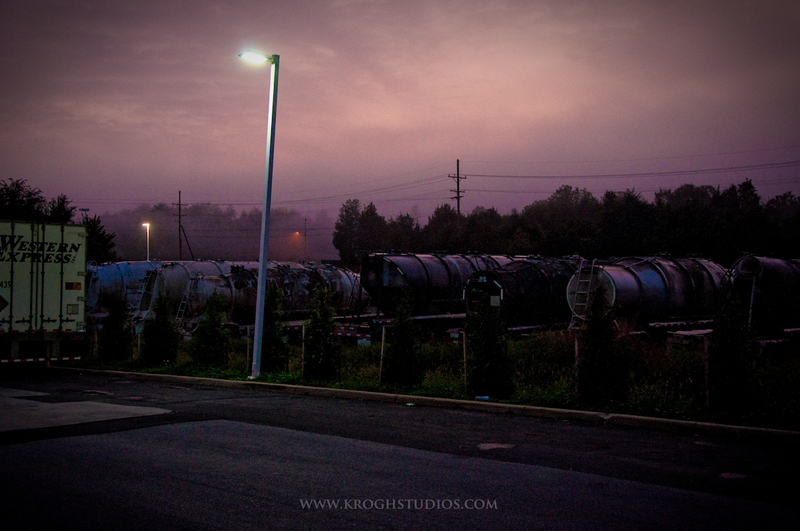 At this post-production studio he spent several weeks working with a many great and truly talented people. After a short while, he began growing a true interest in the southern California life. Drake returned to Delaware with a plan in mind– a vision of a future spent mingling, learning and collaborating with the film, photographic and post-production industries that have not only made LA & California great, but also the entire artistic vision of modern American entertainment. This summer marked a convenient occasion that would allow both Drake and myself to attempt a short but well-planned cross-country trip. As mentioned, Drake discovered a new-found love for southern California and decided he was going to move out west to try his luck in Santa Monica and re-connect with some of the people he met the previous year. My decision to join the adventure laid in the simple yet inescapable fact that I wanted to travel and take pictures… Or maybe, I just need to pick up my stuff that I placed in storage months ago. 🙂 Either way, we both knew this would mark the perfect opportunity to develop a well structured set of projects. As a photographer, I highly enjoy meeting new individuals. With this in mind, I wanted to do a project that went in the photo-story direction. A photograph or portrait accompanied with a short paragraph or article seemed like a solid human-interest piece that yielded value on many levels. For the second project, I wanted something that would easily bring both my talents and Drake’s together in one image. A simple yet effective idea for this was charcoal. 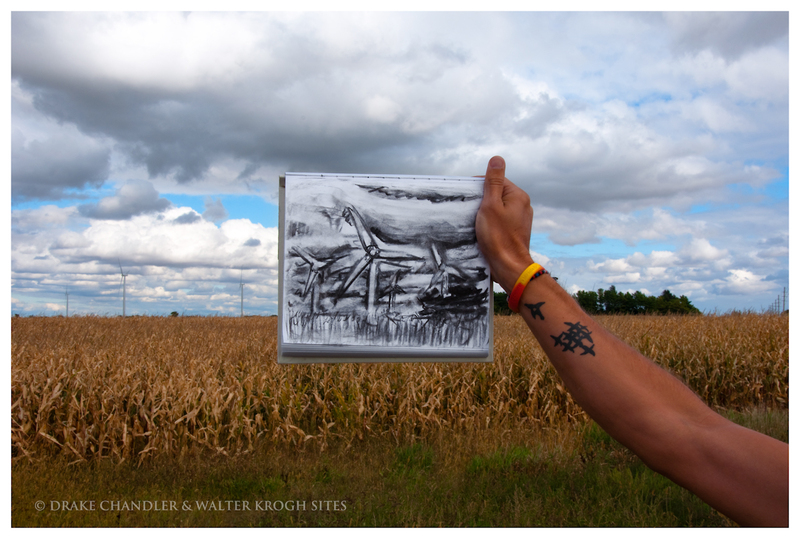 As we travel, Drake would do an abstract charcoal sketch on a pad of a given scene we would come across. 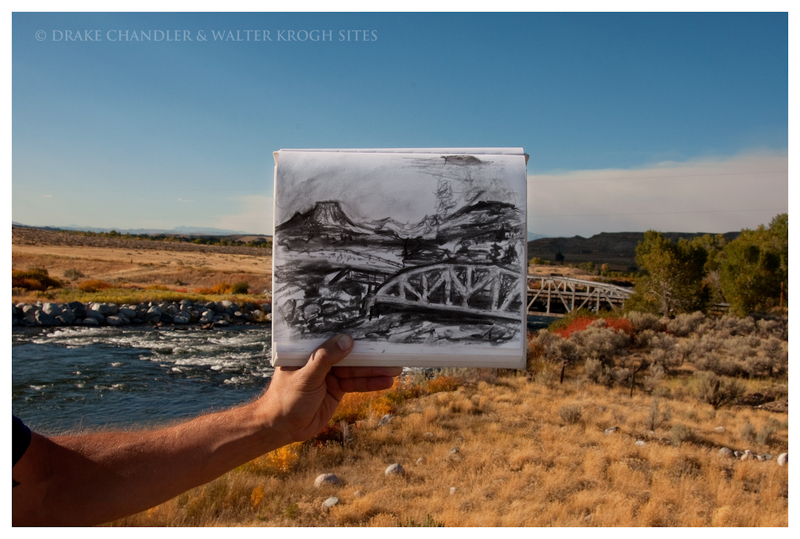 Once the sketch was completed, he would hold it up and allow the sketch to connect within our perspective. Naturally, the final project would be a more straightforward style of what one would expect from travel photography– a little photo-journalism, night time long exposures, fall colors, street signs, out-of-car shots and panoramics. There is allot to photograph out there, so we both hope you will show an interest in our little production and follow us across the USA. Good to see you swung by our blog! We’ve now been driving for a few days and will be making our way farther out west first thing in the morning. Unfortunately, we’ve been to busy to get this blog up in time for you to enjoy 😉 We gave ourselves so many great projects to work on and so many different activities to do that we just haven’t found the time to sit down behind a computer and get this thing done… At least now we have something up and ready and will contribute a ton of new material very very soon!! 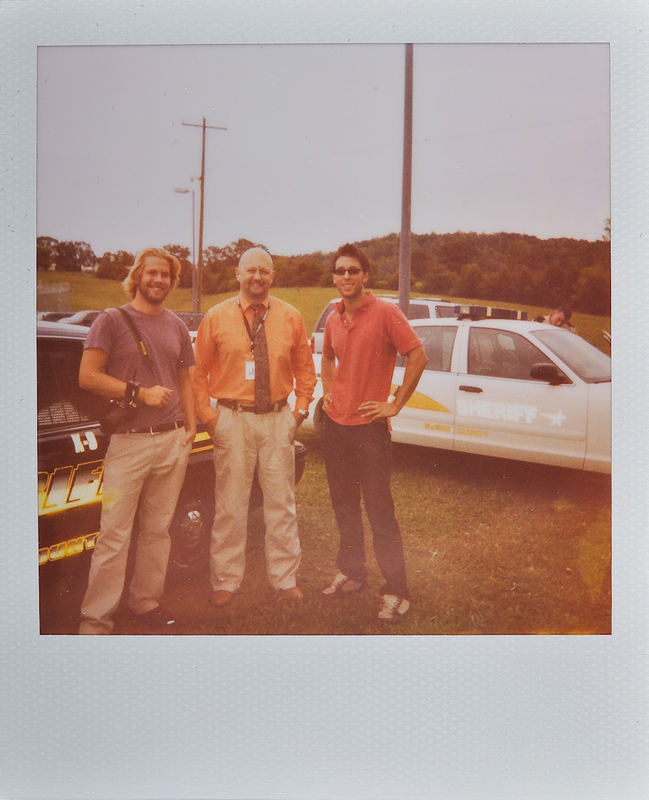 !Please continue to check back as we make our way across the USA!